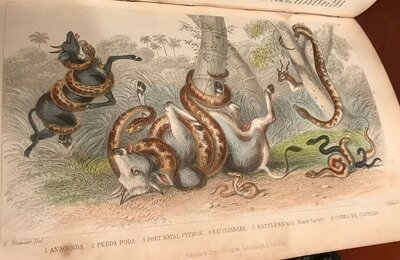 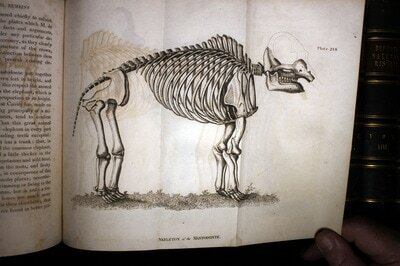 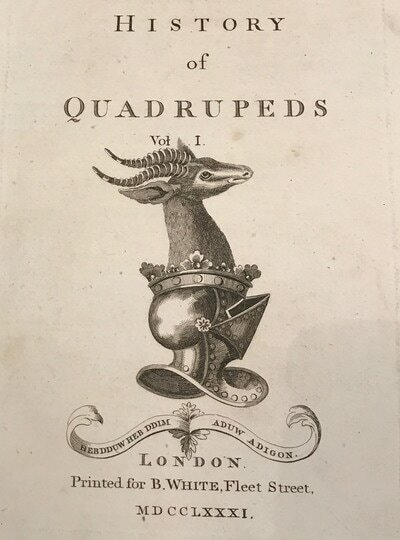 History of Quadrupeds by Thomas Pennant, was Published in London: by B.White;- Fleet Street;- 1781. 1st. 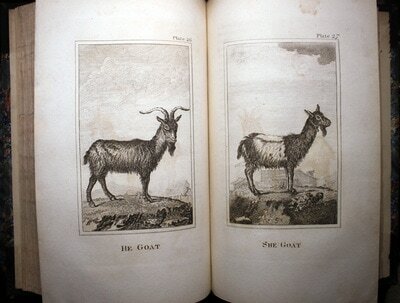 Edition in 2 volumes. 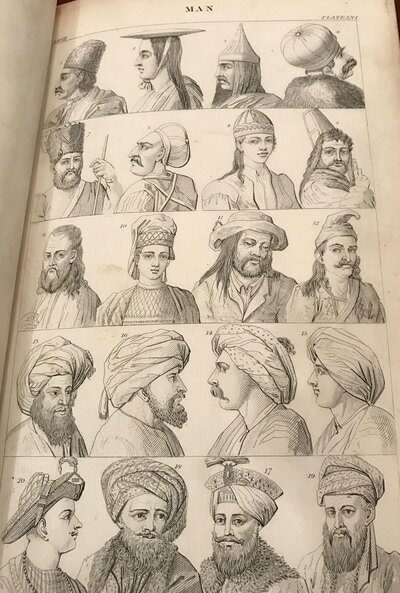 Small Folios;- With 52 superb full page plates, plus 2 engraved title-pages vignettes. 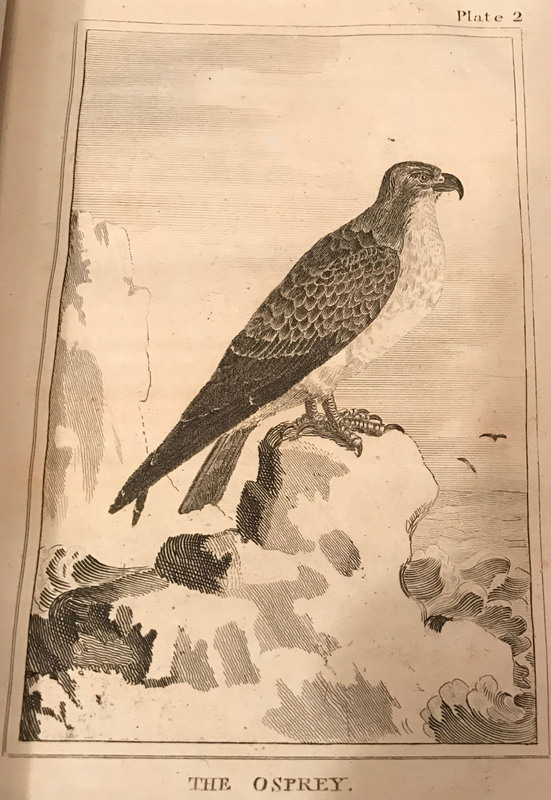 Original light brown full leather bindings;- 1781 on both volumes;- Thomas Pennant's interest in natural history began at the age of 12 when he was given a copy of Francis Willoughby's 'Ornithology'. 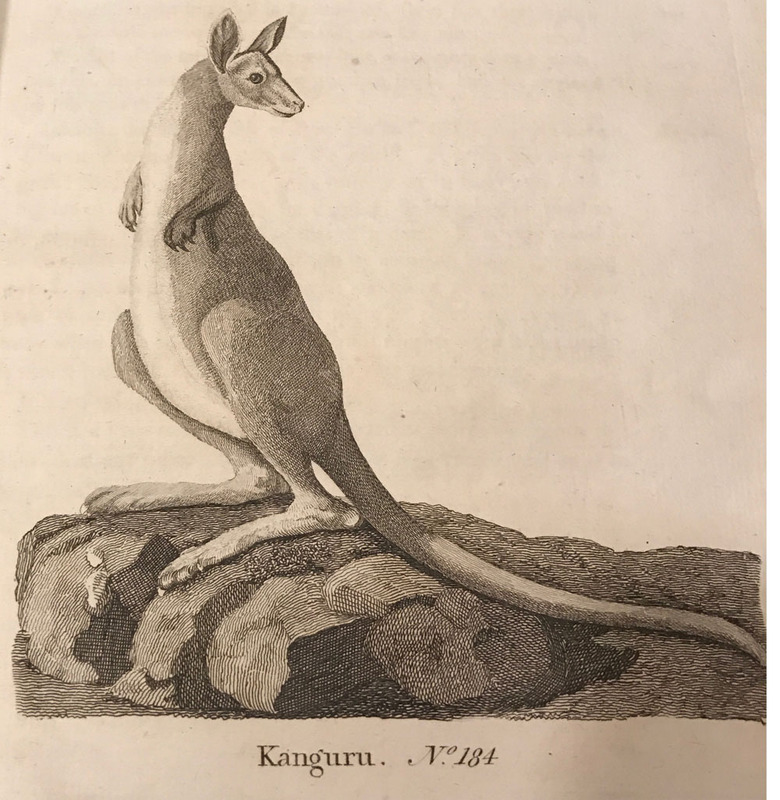 In 1755 he began a correspondence with Linnaeus, and was elected a member of the Royal Society of Upsala in 1757. 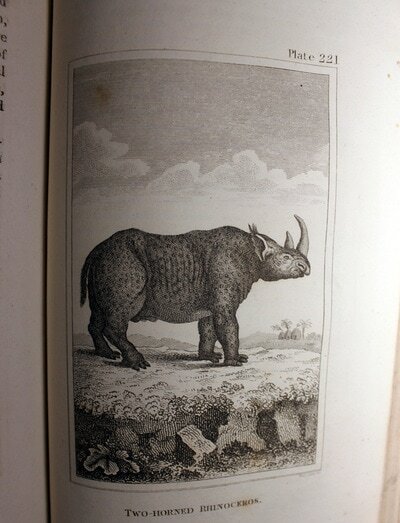 He began his work 'British Zoology' in 1761, and published the first part in 1766. 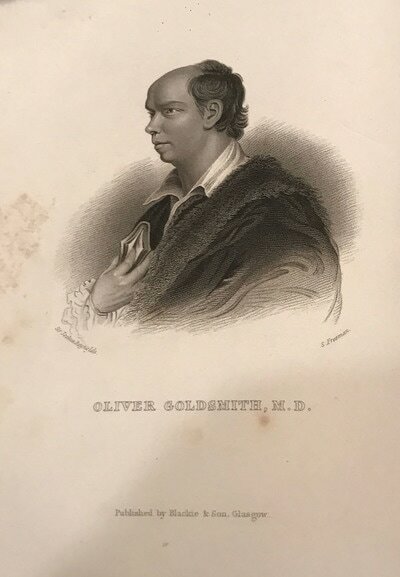 He gave the profits of this work to the Welsh School in London. 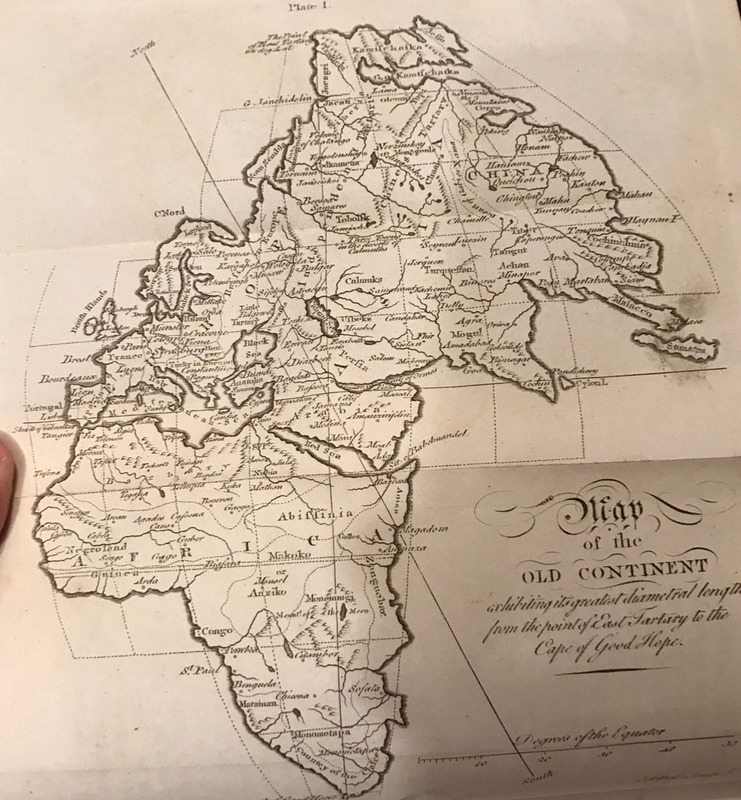 Pennant made a tour of Scotland in 1769, and published a volume of his findings. 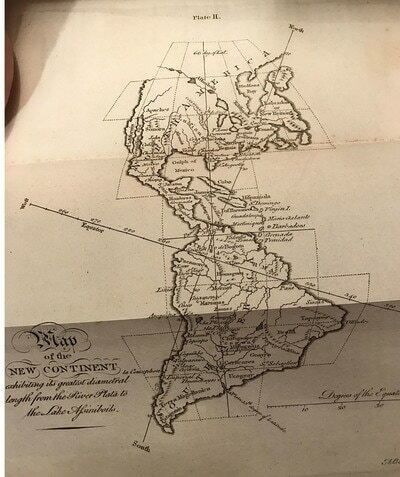 He did the same for Wales. 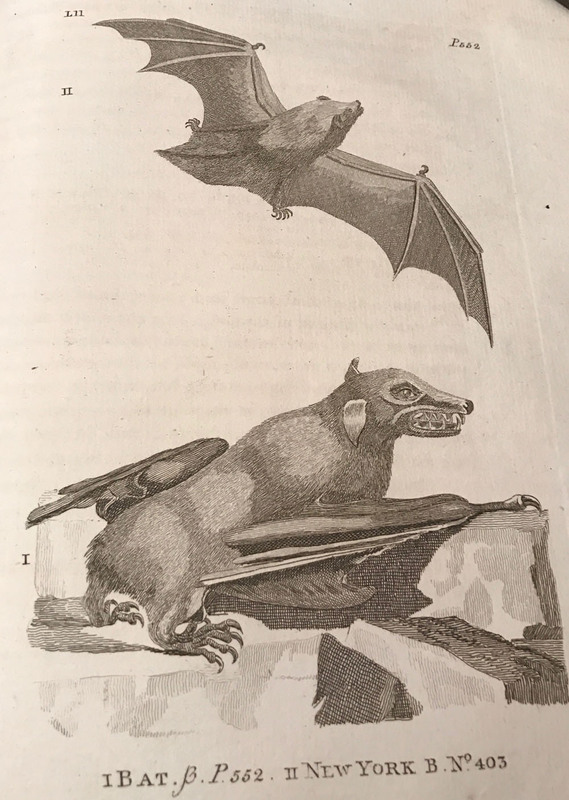 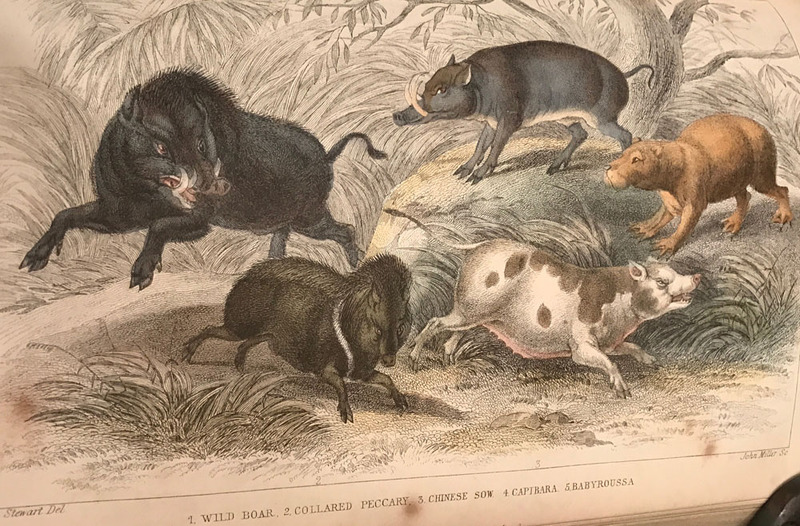 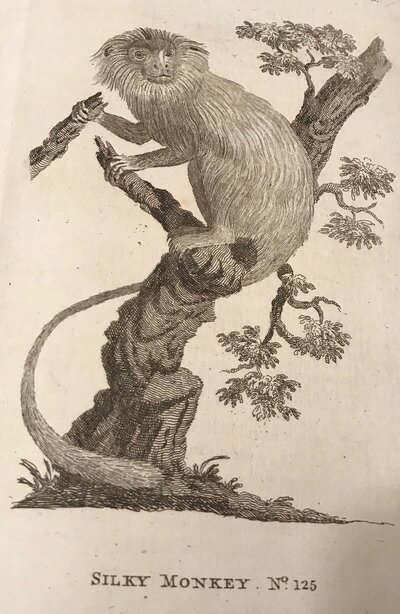 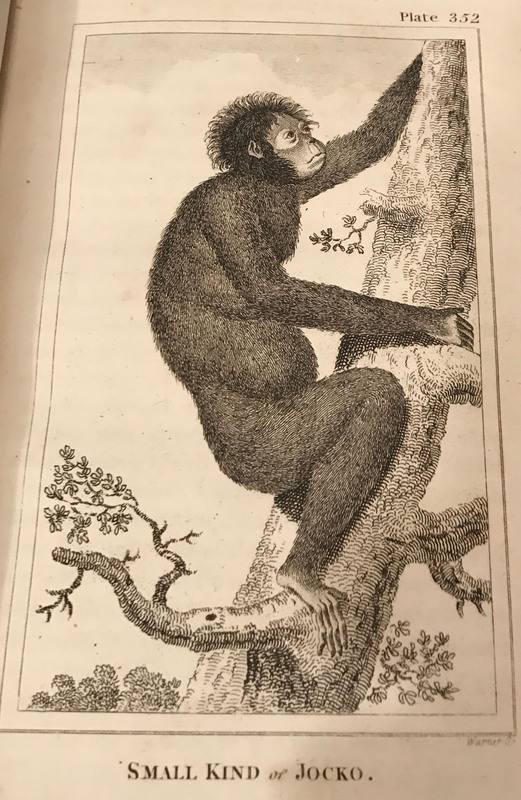 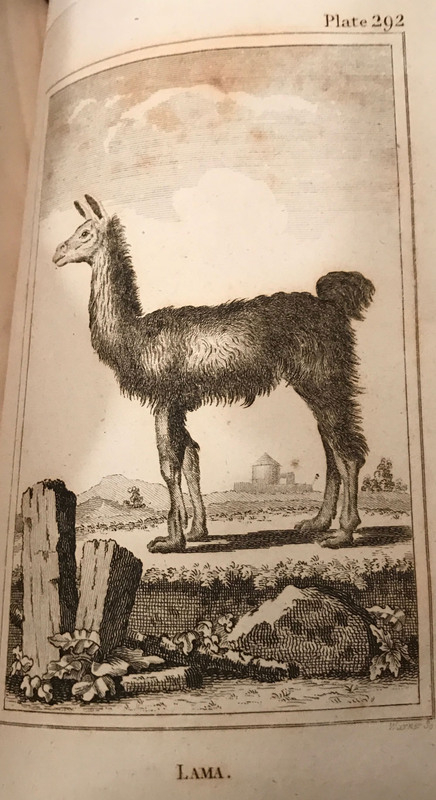 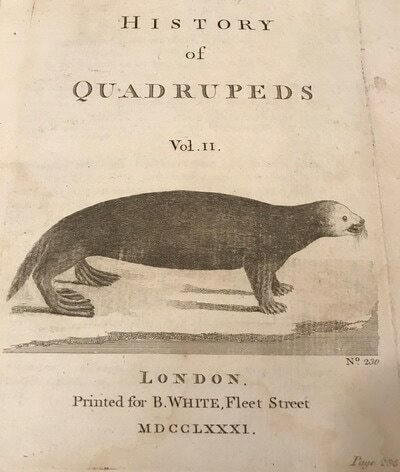 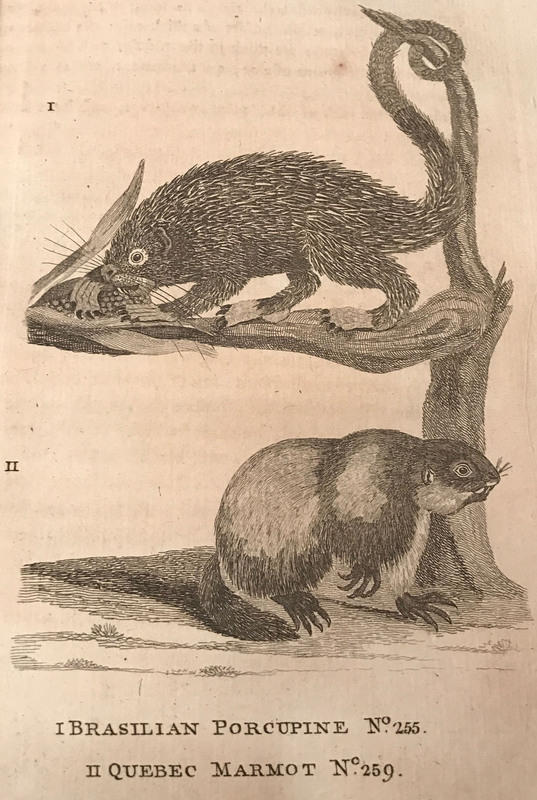 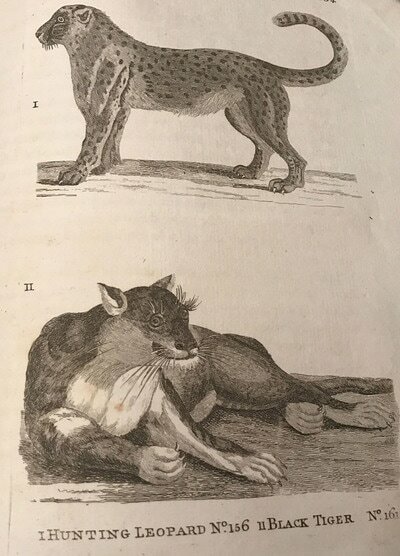 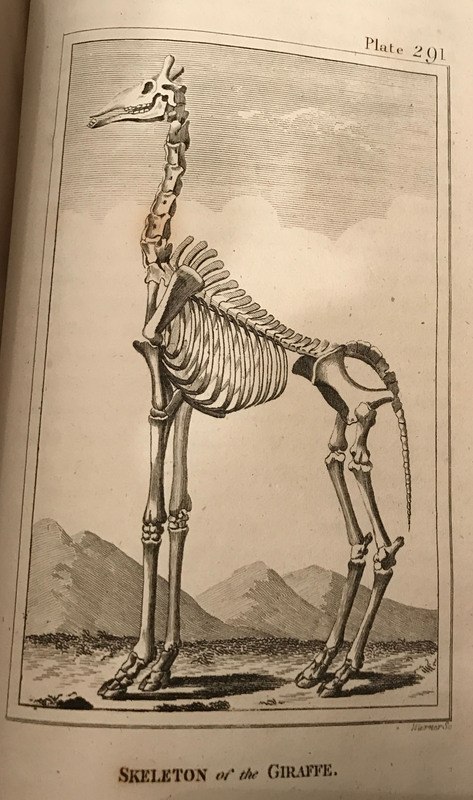 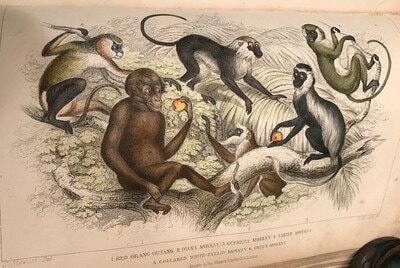 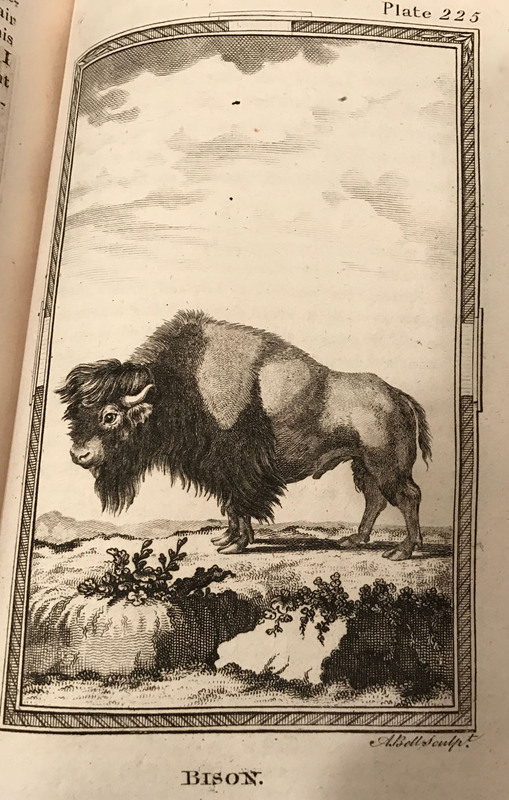 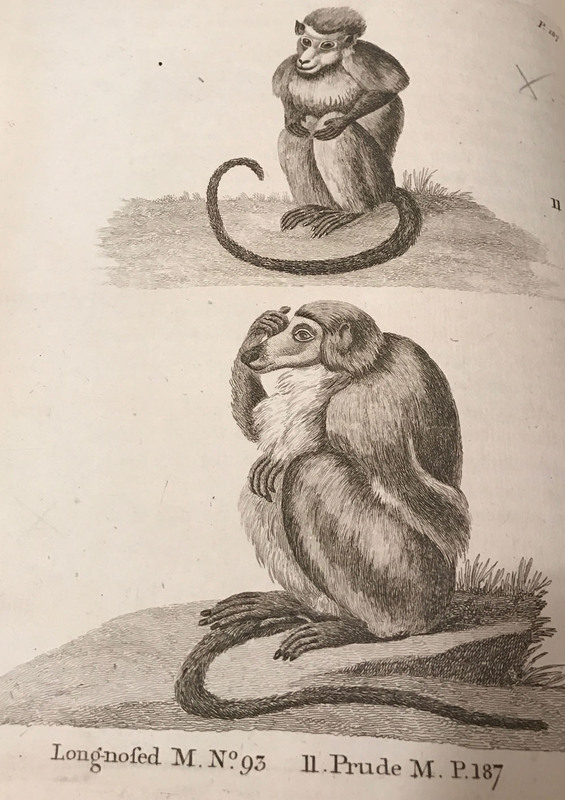 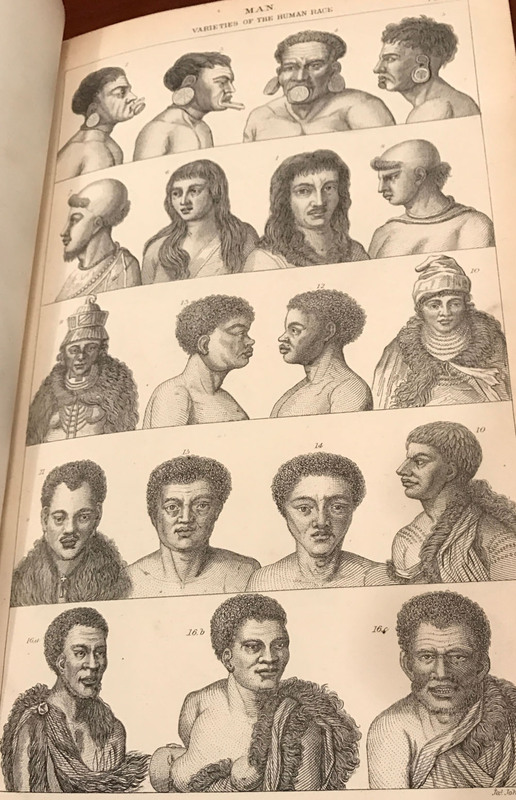 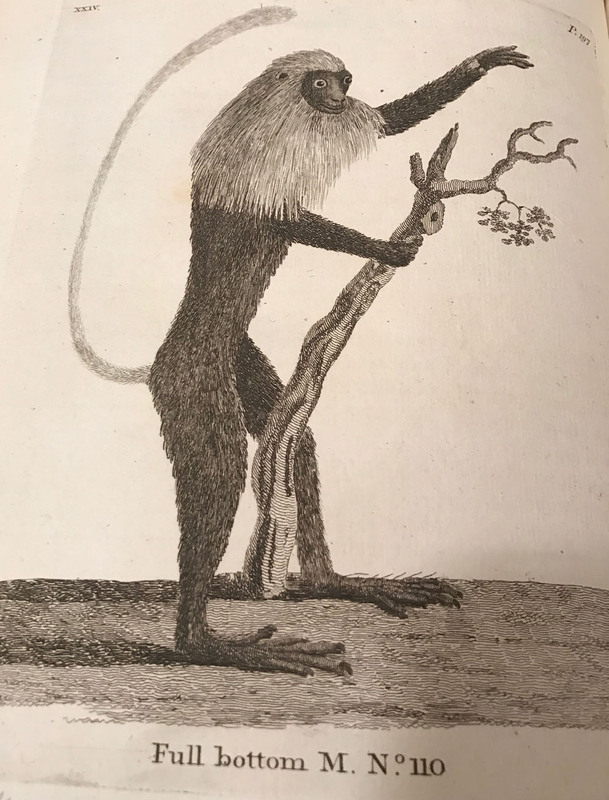 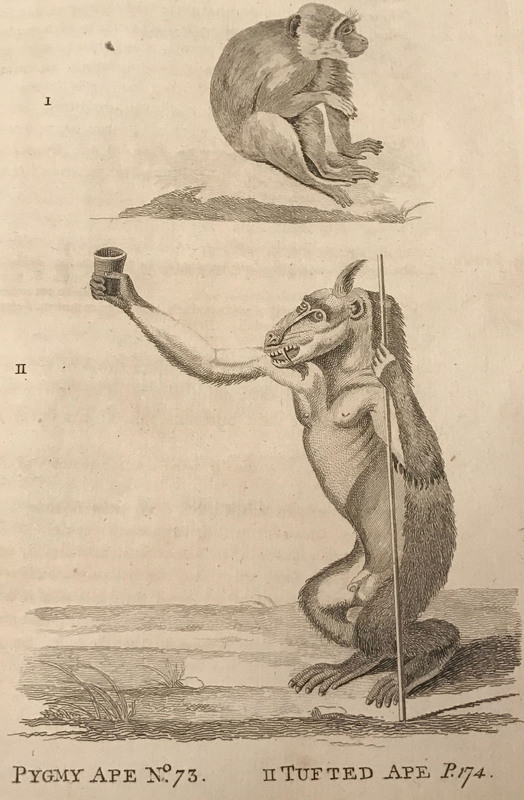 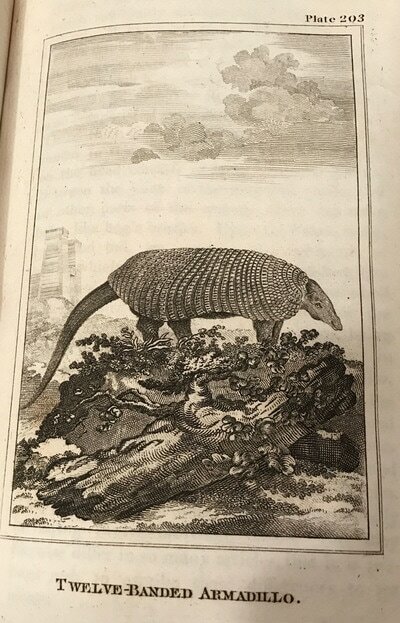 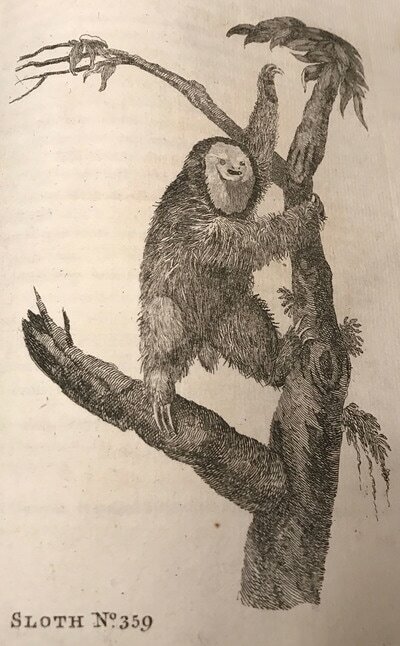 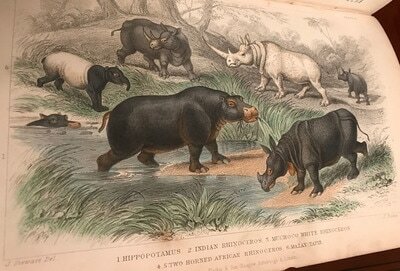 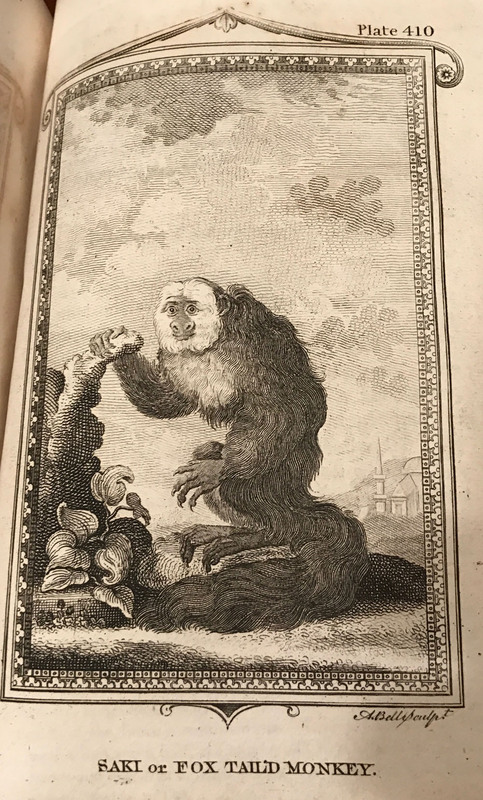 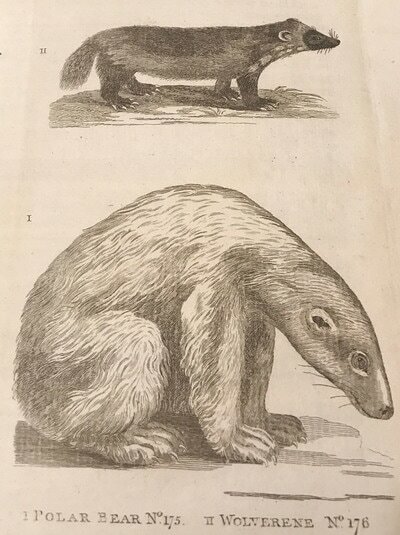 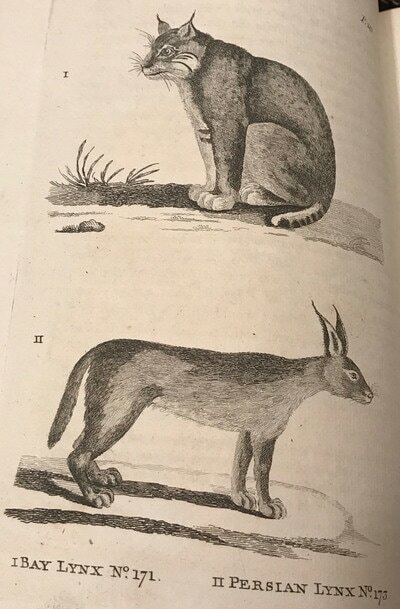 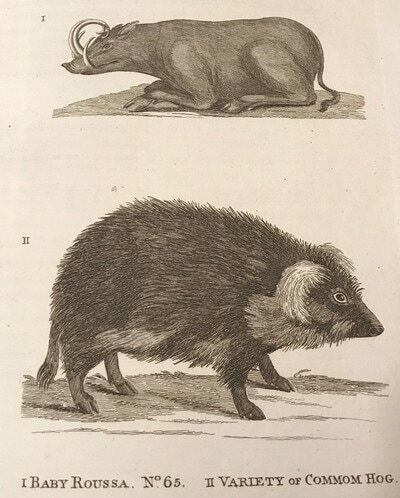 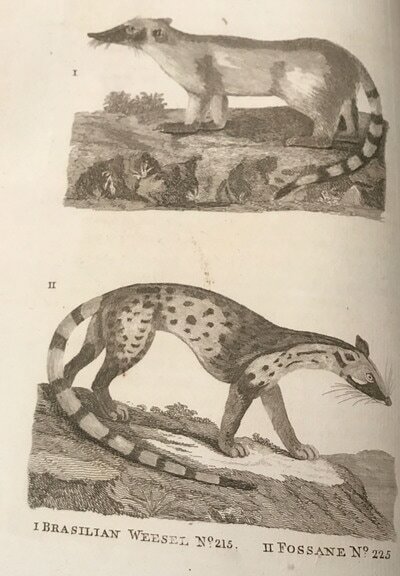 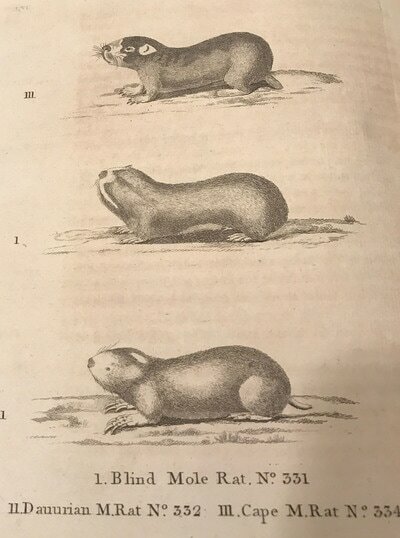 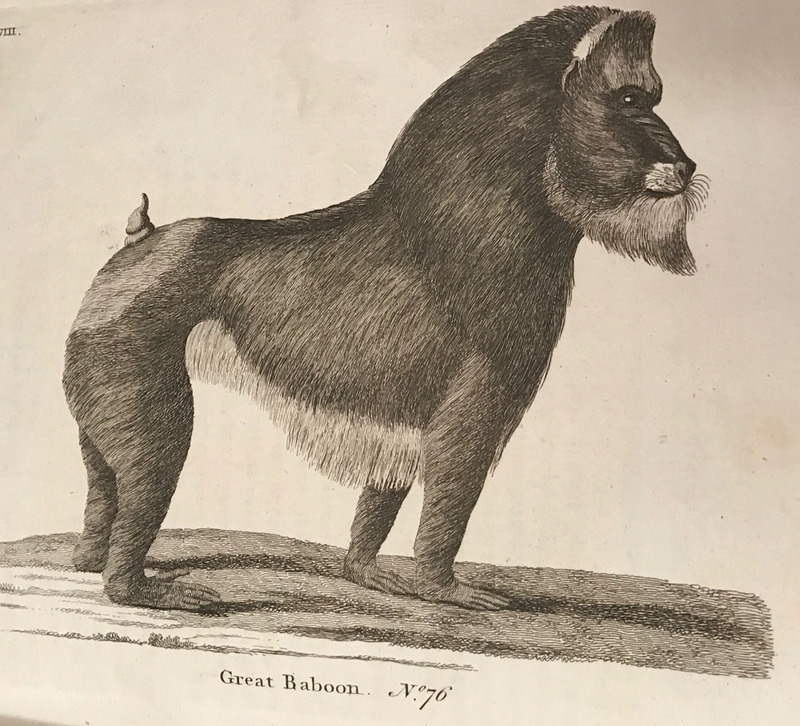 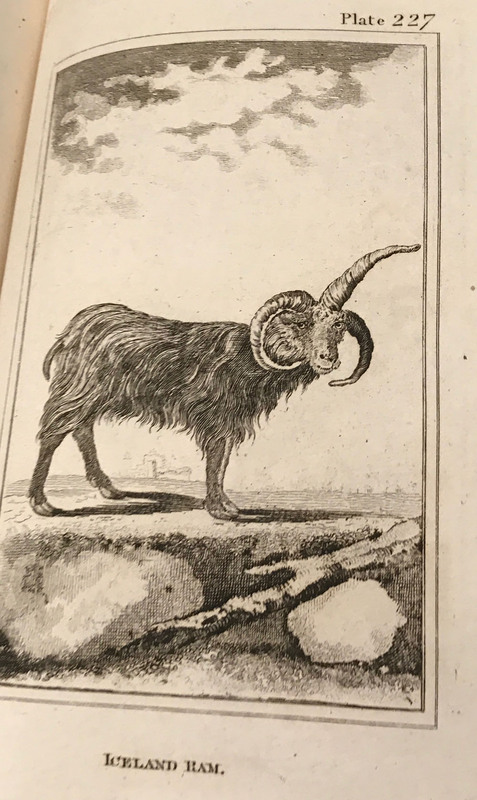 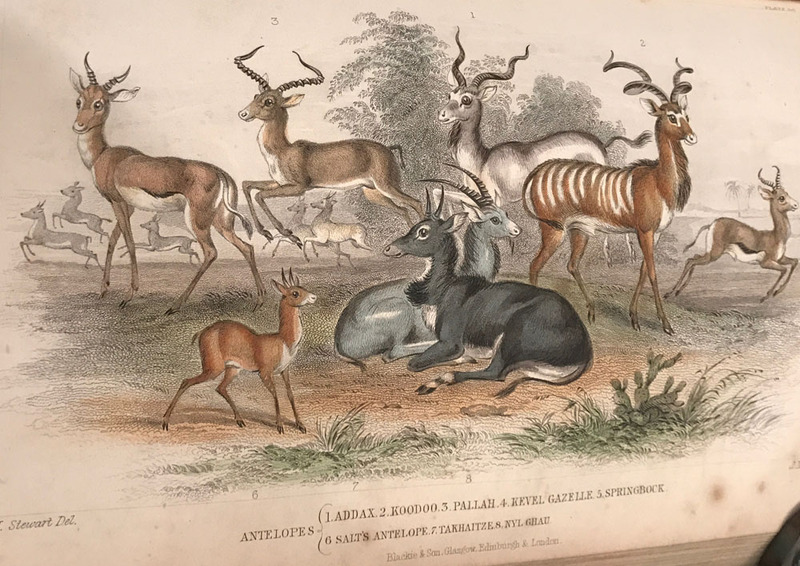 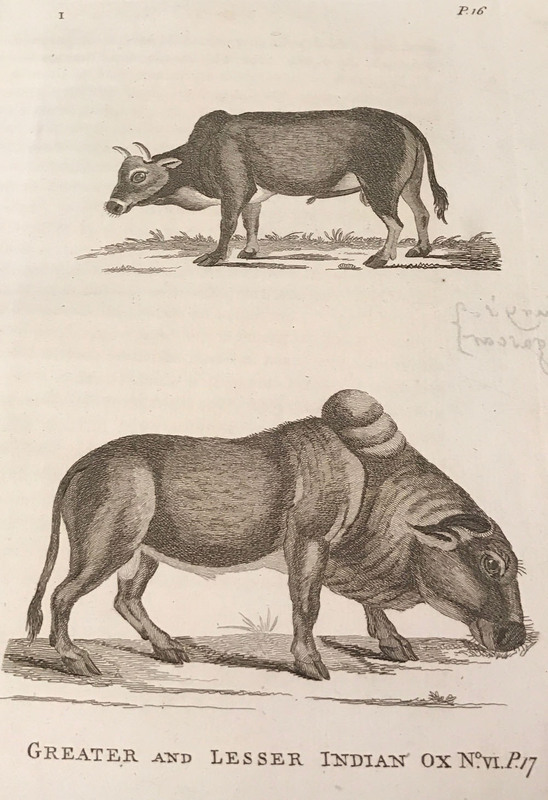 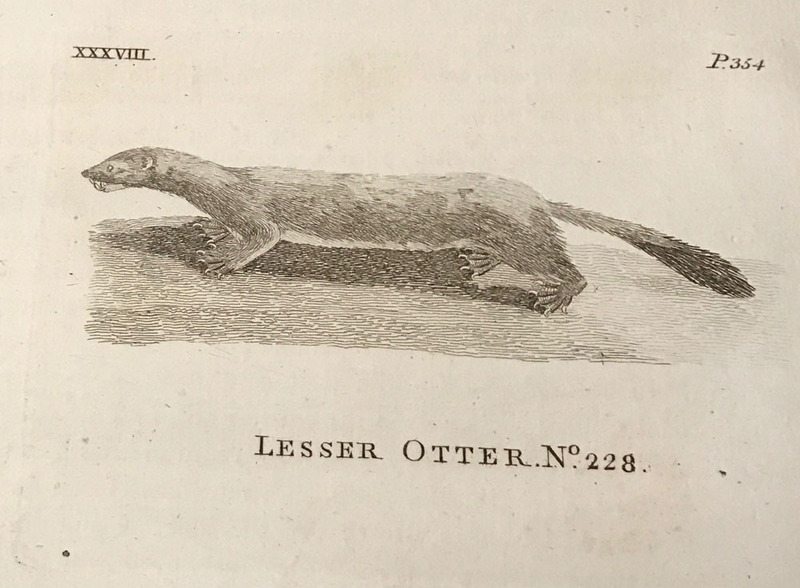 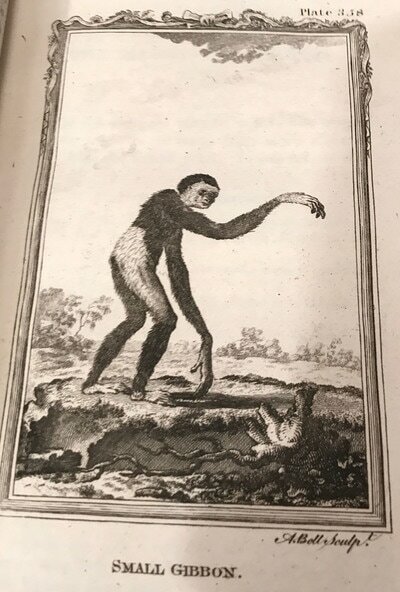 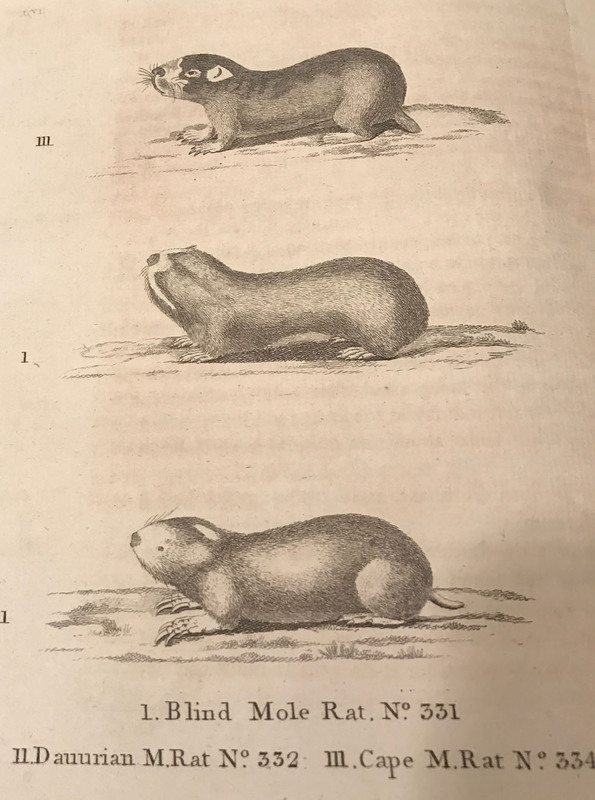 In 1781, he published his own work, the 'History of Quadrupeds', a new and enlarged edition of his 'Synopsis of Quadrupeds' which had been published in 1771. He followed this by publishing other journeys, including, 'London', and 'Arctic Zoology'. 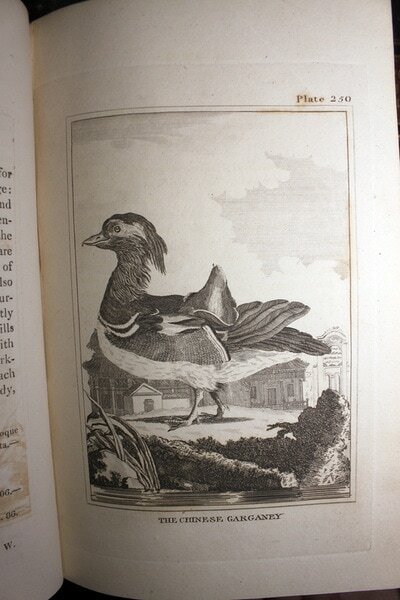 From about 1777, he stayed closer to home, publishing many other works. 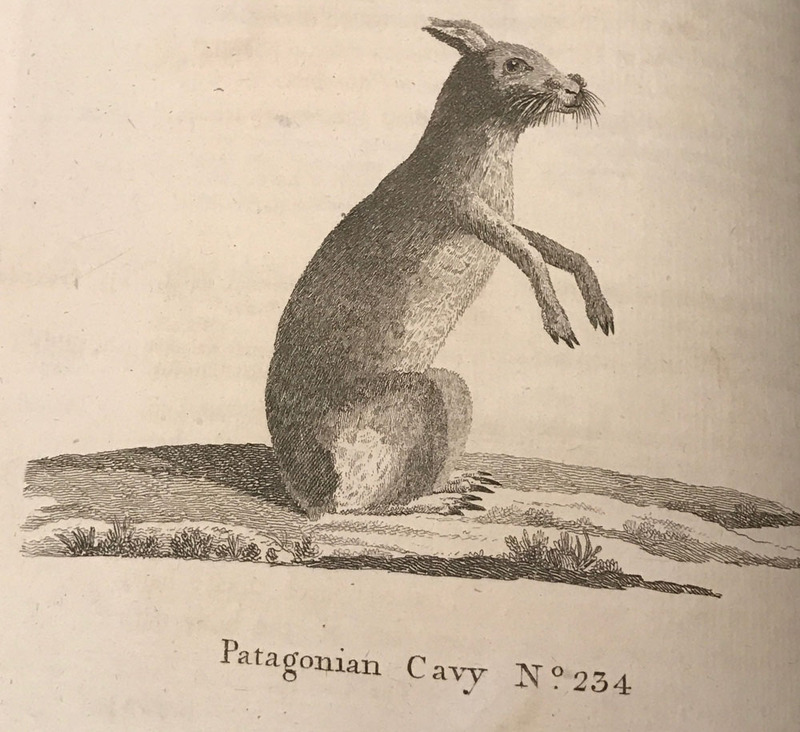 Pennant's name stands high among the naturalists of the 18th.Century, and he has been commended for making dry and technical matters interesting. His 'British Zoology' and 'History of Quadrupeds', arranged according to the classification of John Ray, long remained classical works. 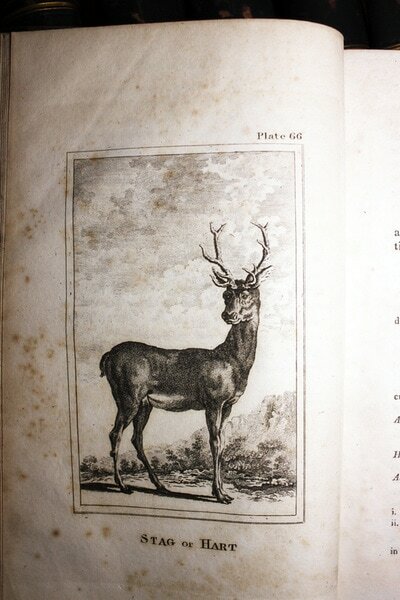 The Publisher Benjamin White was the brother of Gilbert White (Natural History of Selbourne). 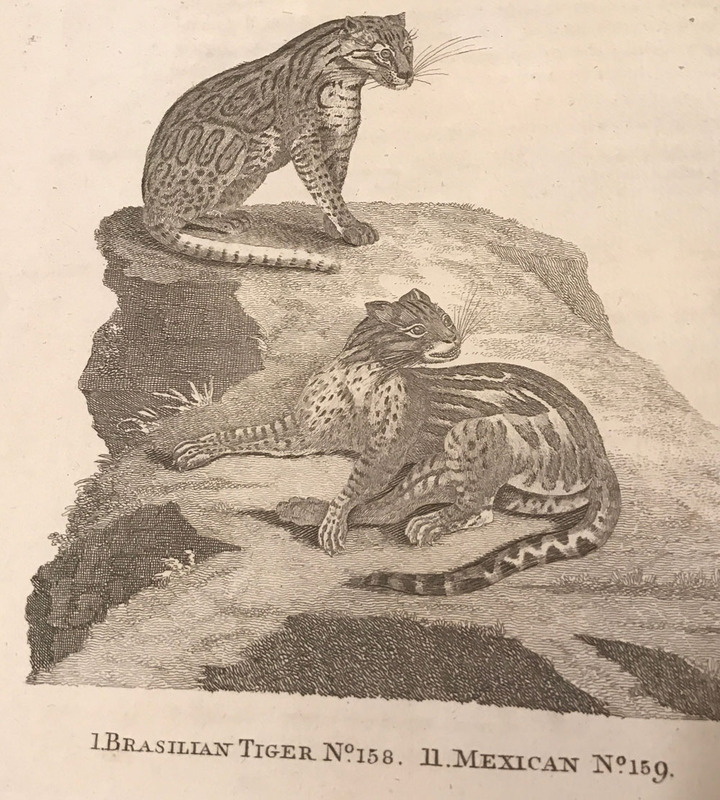 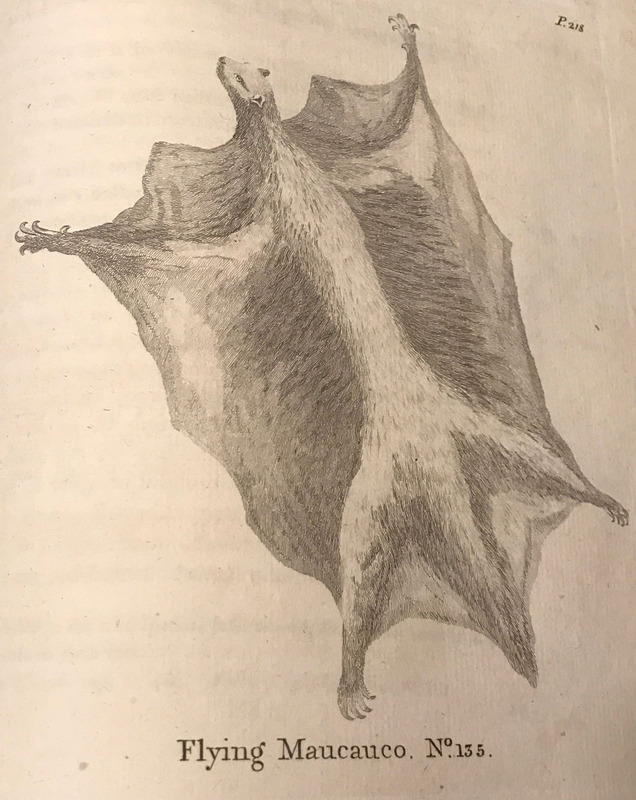 Benjamin White suggested to Pennant that his publishing firm should bring out a new edition of Pennant's British Zoology (first pub. 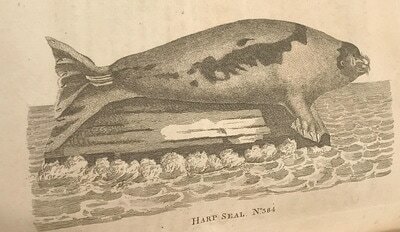 in 1761). 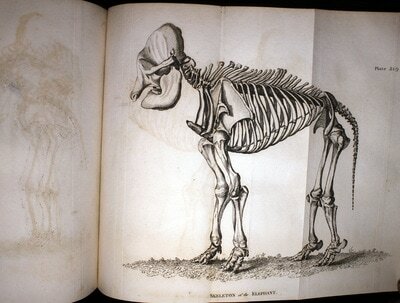 ​ Highly collectable 2 Volumes of Natural History. 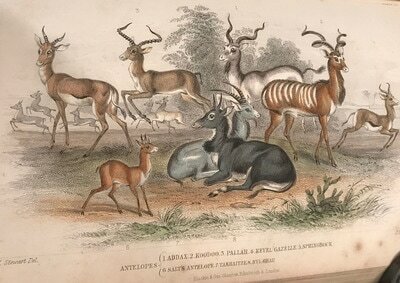 In fine condition, the bindings are worn, but the contents are very clean..Rare, All engraved plates are present with a few light contemporary pencil notes. 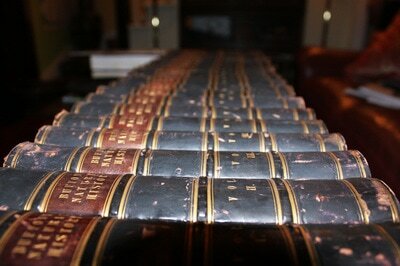 The original brown lather binding is worn, with gilt line and lettering to the spine of both copies. 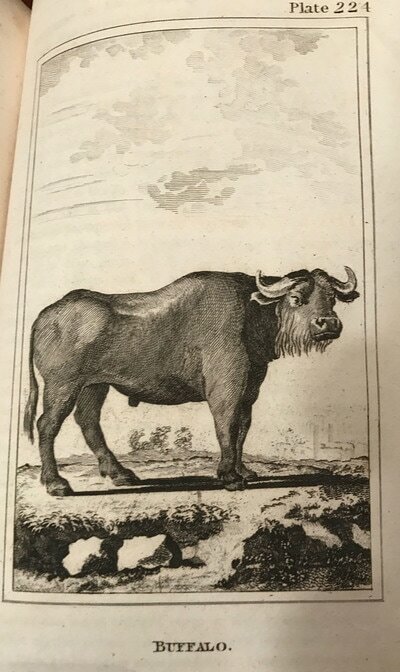 284 pages to volume 1. 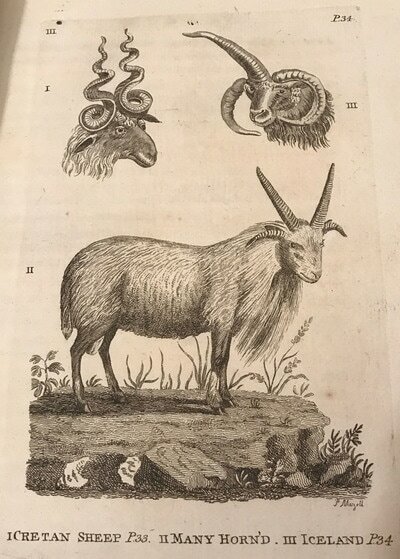 255 pages to volume 2. including Additions, plus 4 pages of Index and then another 8 pages of Index of Classical Names, Foreign Names and the Names of Quadrupeds, in the Works of M. De Buffon, At the end of the 8 pages of Index on the 8 page is Errata. Than 2 of Ads for Books of National History, Printed for Benjamin White, Publisher of these 2 volumes. 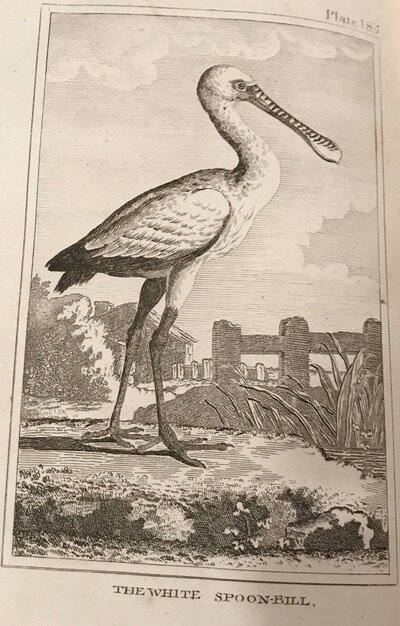 Thomas Pennant's name stands high among the naturalists of the 18th. 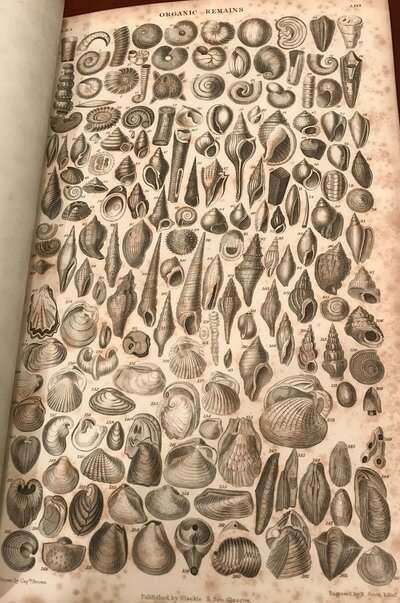 century, he has been commended for making dry and technical matter interesting. His ‘British Zoology’ and ‘History of Quadrupeds,’ arranged according to the classification of John Ray, long remained classical works, though in point of style and method of presentment they are greatly inferior to the works of Buffon. Cuvier in his memoir of Pennant, written about 1823 for the ‘Biographie Universelle,’ says that Buffon profited by Pennant's ‘History of Quadrupeds,’ 1781, though in the third edition Pennant himself has drawn on Buffon. 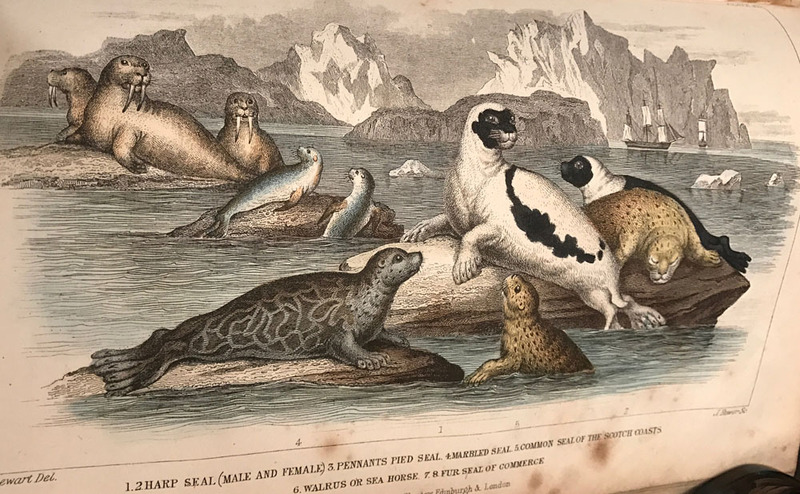 He describes the work as ‘encore indispensable,’ and praises the ‘Arctic Zoology’ as valuable to naturalists. 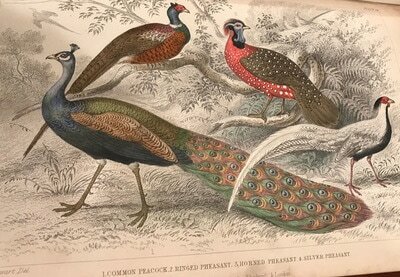 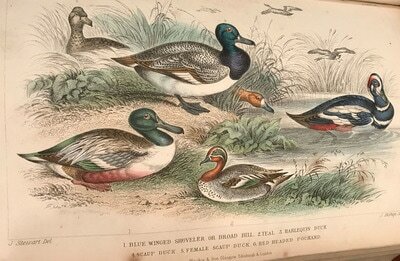 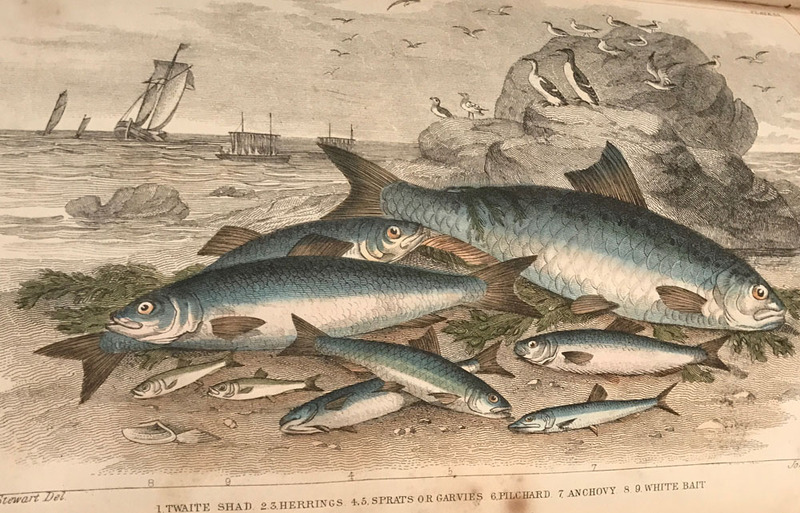 Pennant's works on natural history were much valued at the time of their publication, and contained the greater part of the knowledge of their times. Georges-Louis Leclerc, Comte de Buffon;- Born 7 September 1707 – Died16 April 1788 was a French Naturalist , Mathematician, Cosmologist and encyclopedic author. 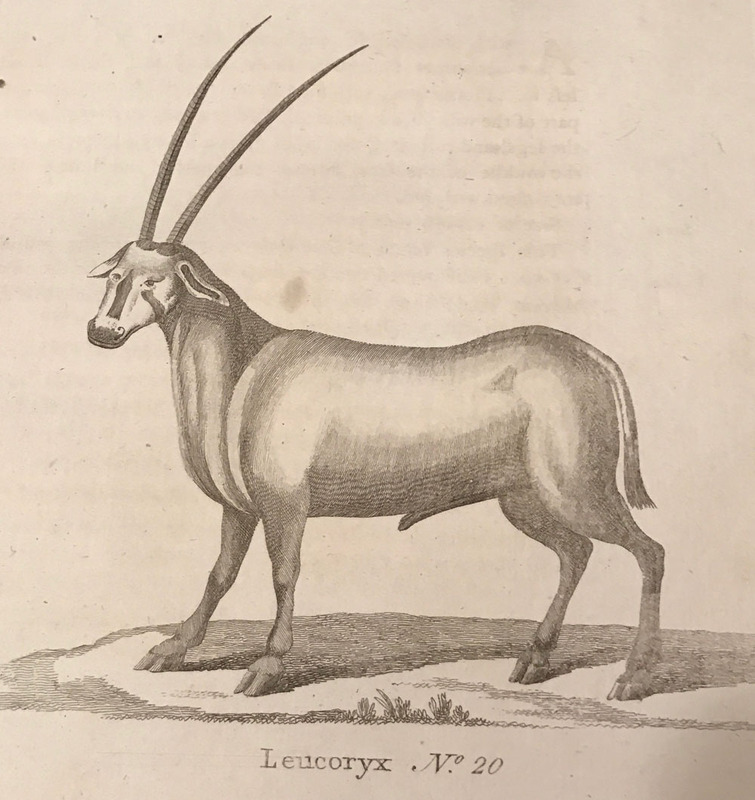 His works influenced the next two generations of Naturalists, including Jean Baptiste Lamarck and George Cuvier. 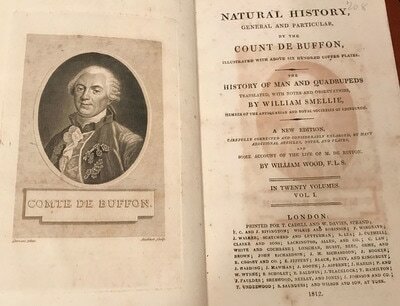 Buffon published thirty-six quarto volumes of his Histoire naturelle during his lifetime; with additional volumes based on his notes and further research being published in the two decades following his death. 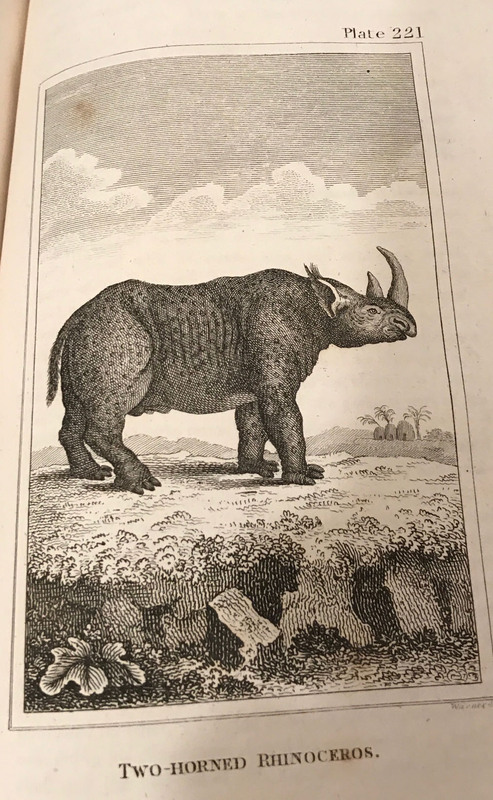 It has been said that "Truly, Buffon was the father of all thought in natural history in the second half of the 18th century". 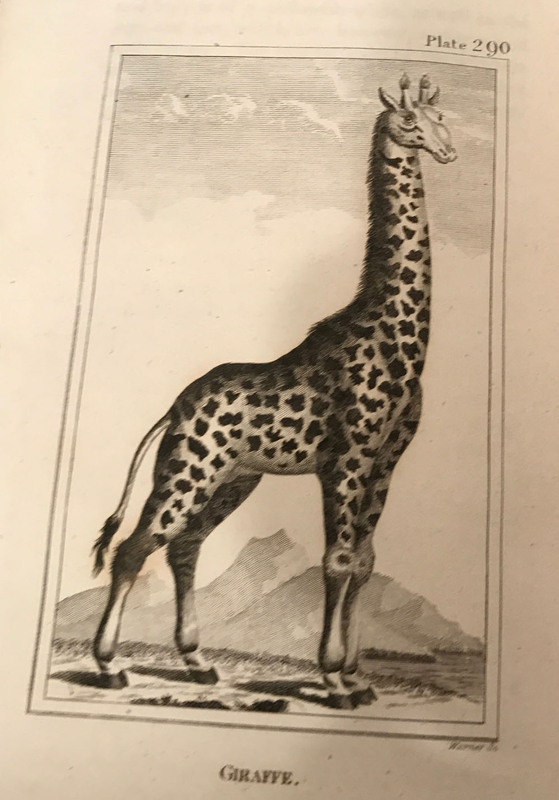 Buffon held the position of intendant (director) at the Jardin du Roi, now called the Jardin des Plantes;- it is the French equivalent of Kew Gardens. 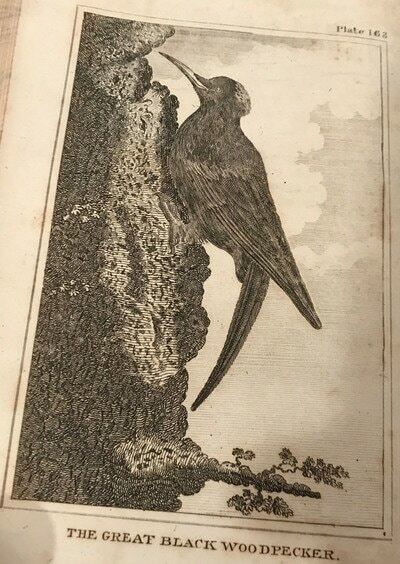 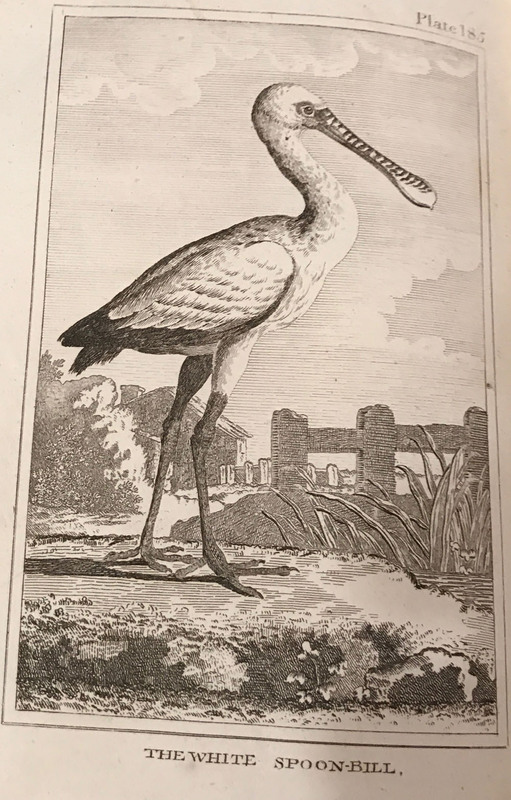 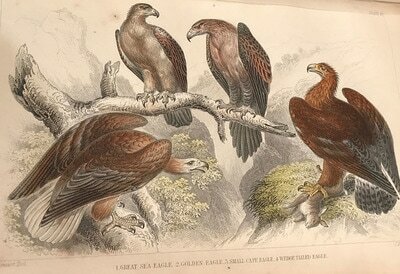 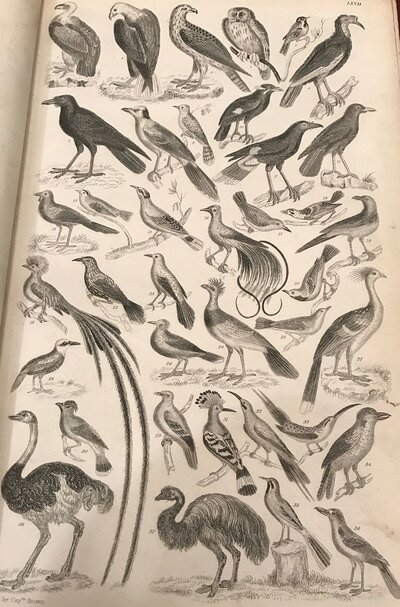 William Smellie (1740–1795) was a Scottish Master Printer, Naturalist, Antiquary, editor and Encyclopedist. 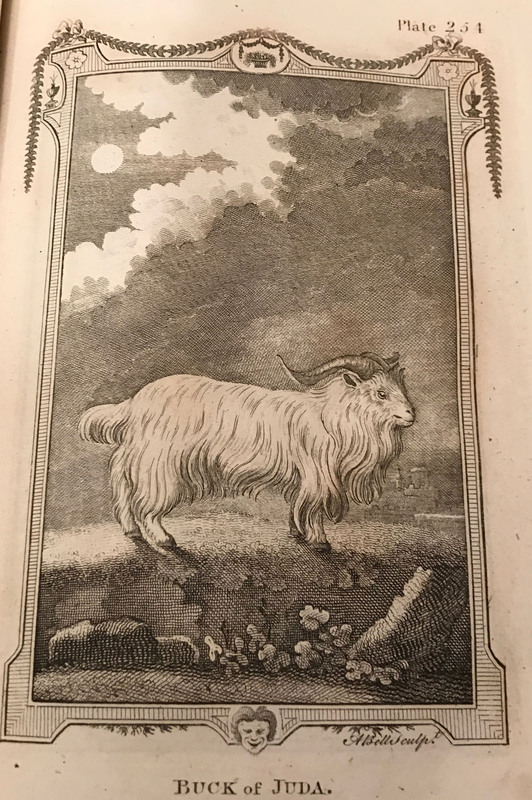 He was friends with Robert Burns, whose assessment is engraved on Smellie's tombstone: "Here lies a man who did honour to human nature". 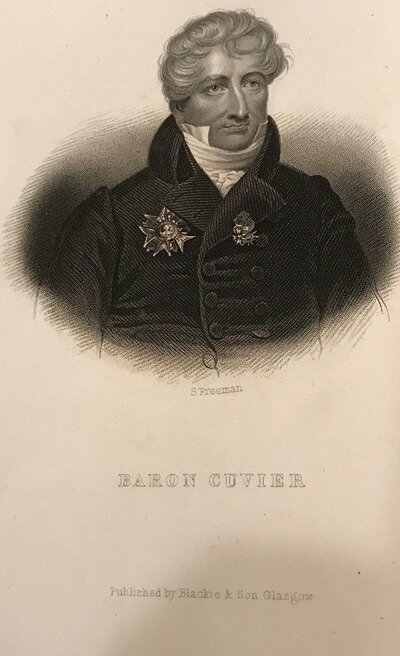 Burns also described him fondly in a letter as "that old Veteran in Genius, Wit and Bawdry". 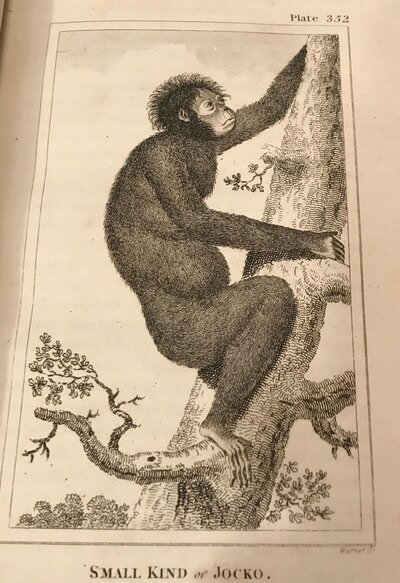 Smellie is also noted for his English translation of the famous Histoire Naturelle of the French naturalist Georges-Louis Leclerc, Comte de Buffon. 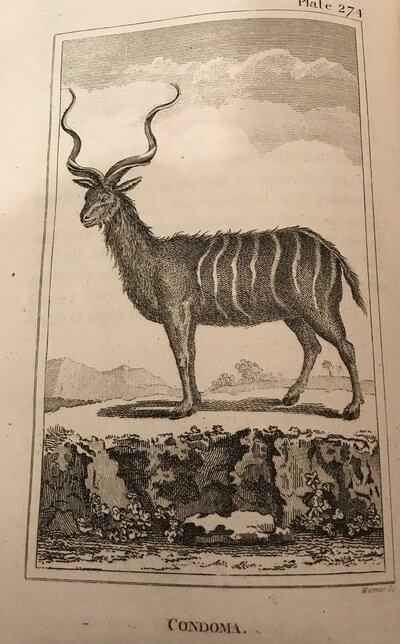 In 1779, Smellie was nominated to be the University of Edinburgh’s Professor of Natural History; however, the post was awarded to Dr. John Walker, allegedly due to politics. Charles Darwin wrote in his preliminary historical sketch added to the third edition of On the Origin of Species: "Passing over Buffon, with whose writings I am not familiar". 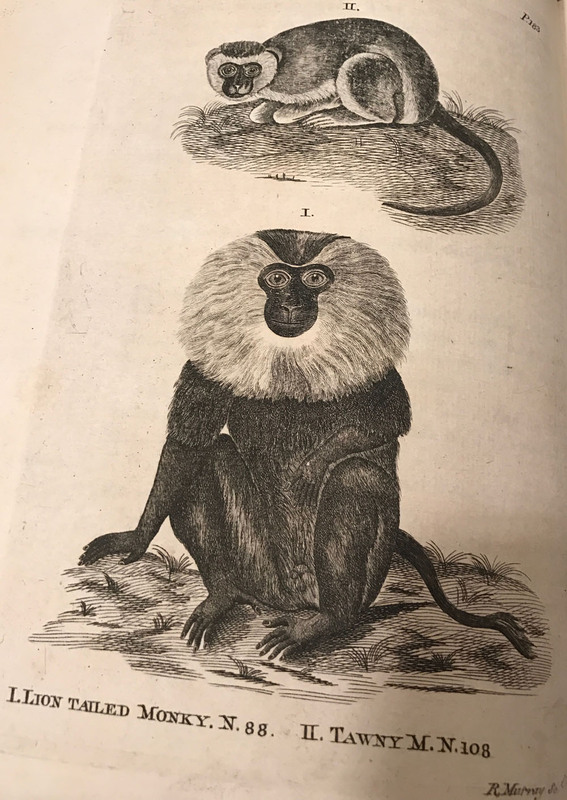 Then, from the fourth edition onwards, he amended this to say that "the first author who in modern times has treated it [evolution] in a scientific spirit was Count Buffon. 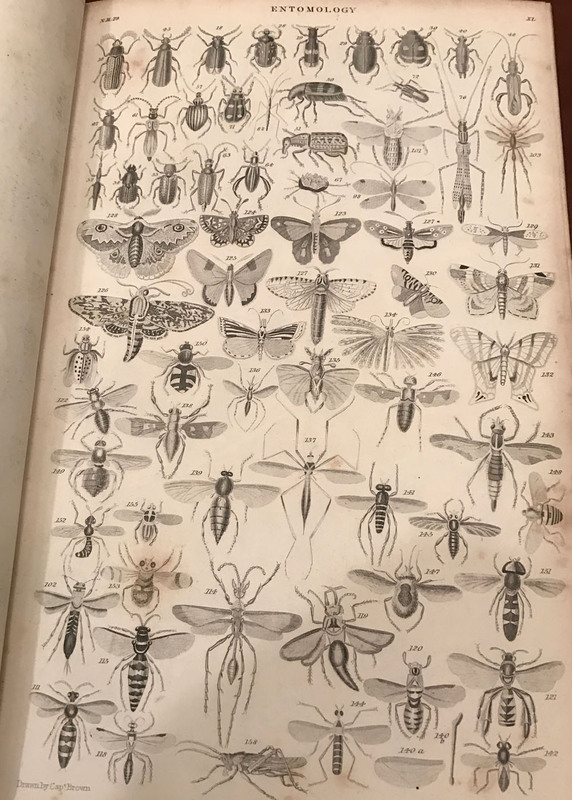 But as his opinions fluctuated greatly at different periods, and as he does not enter on the causes or means of the transformation of species, I need not here enter on details". 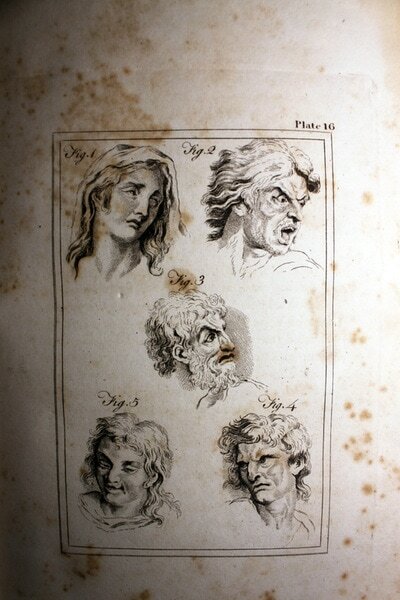 Buffon's work on degeneration, however, was immensely influential on later scholars but was overshadowed by strong moral overtones. 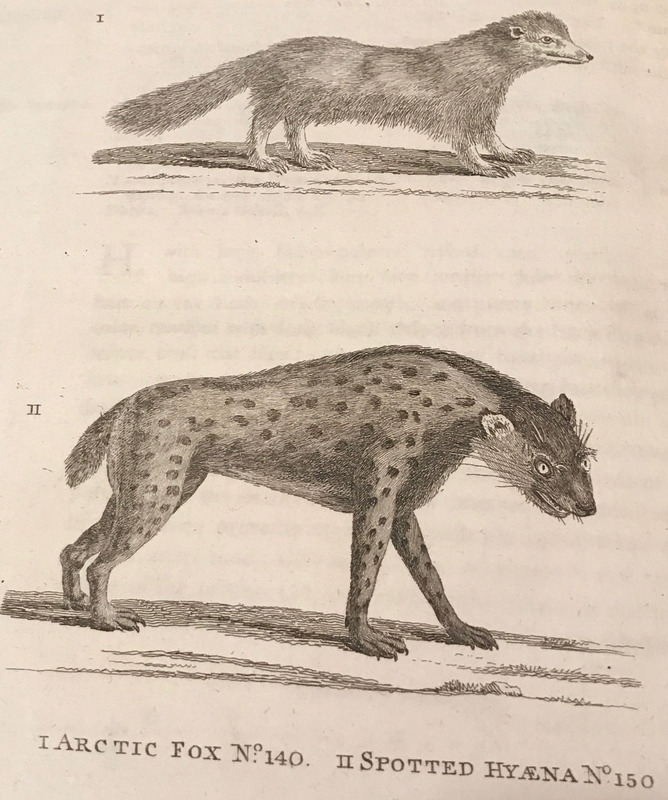 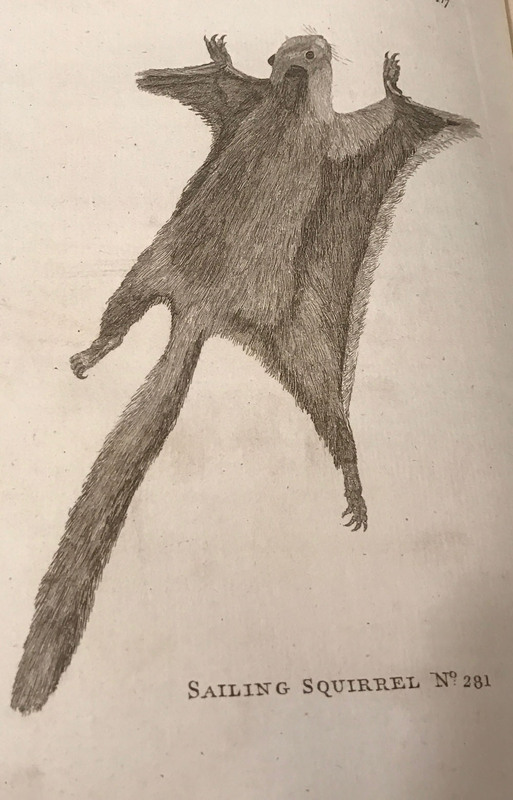 Throughout Count Buffon's travels, he noticed that even though geographic areas were nearly the same, each place had unique wildlife that was similar to wildlife in other areas.He hypothesised that they were all related in some way and that their environments were what made them change. Once again, these ideas were used by Darwin to help come up with his idea of natural selection. 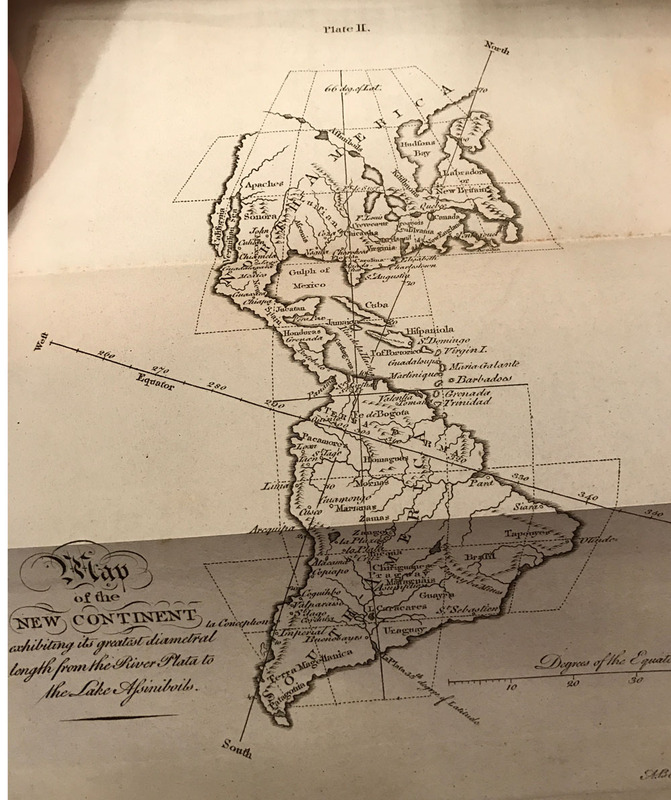 It was very similar to the evidence he found when travelling on the HMS Beagle collecting his specimens and studying nature. 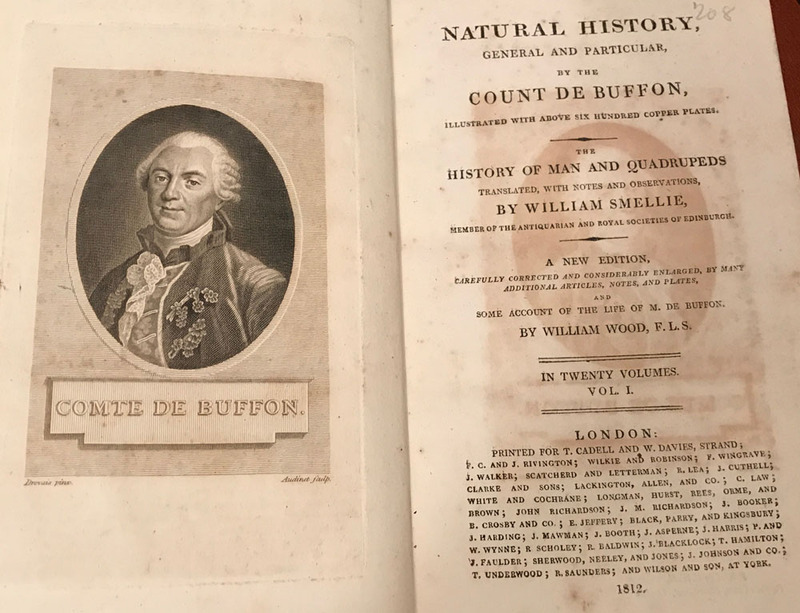 The Comte de Buffon's writings were used as evidence for Darwin while he wrote about his findings and presented them to other scientists and the public. 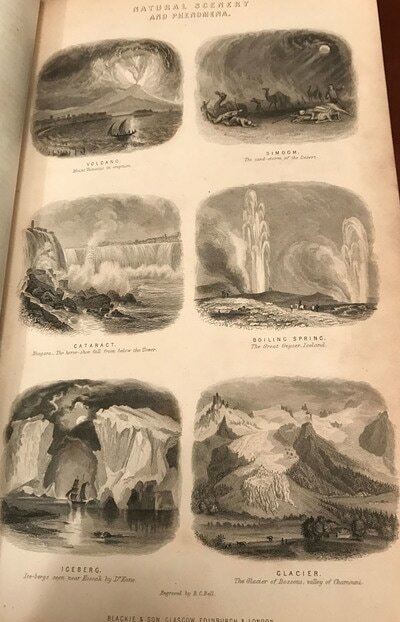 A History of the Earth and Animated Nature by Oliver Goldsmith. 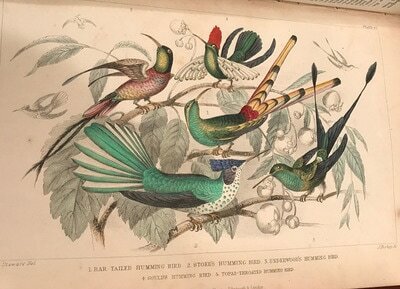 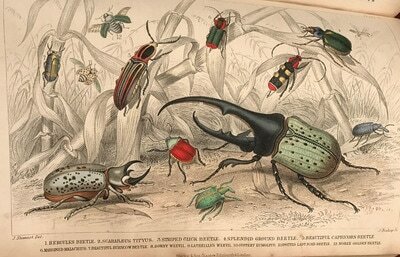 1859 With Numerous Notes from the Works of the Most Distinguished British and Foreign Naturalists. 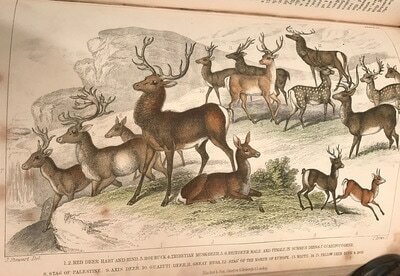 Coloured Illustrated By Upwards of Two Thousand Figures;- Complete 2 Volume Set;- Published by Blackie and Son, Frederick St. Glasgow 1859 - Complete set of 2 Volumes in handsome Contemporary three quarter dark brown leather bindings, with with cloth centre panels to to front and back of both volumes 1, and 2. . Gilt Titles to both spines and gilt decorations to both spines. 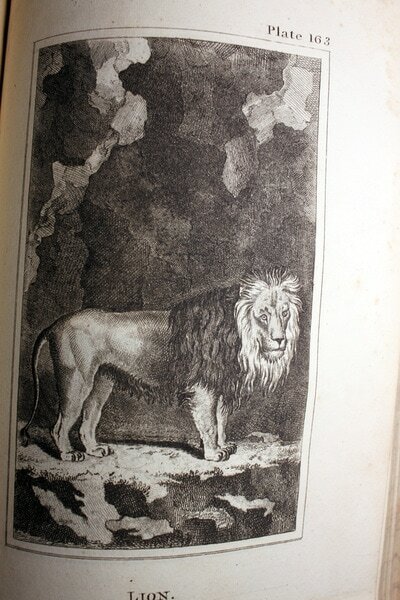 The binding is wrong and slightly scruffy, all Page Edges to both volumes are marbled. Frontispiece of Vol I illustrated with an engraved portrait of Oliver Goldsmith, after Sir Joshua Reynolds, opposite an illustrated, Coloured Title Page with tissue paper guard, the coloured title-page shows many Birds and Beasts in a forest landscape, followed by another title-page with the date, 1859. 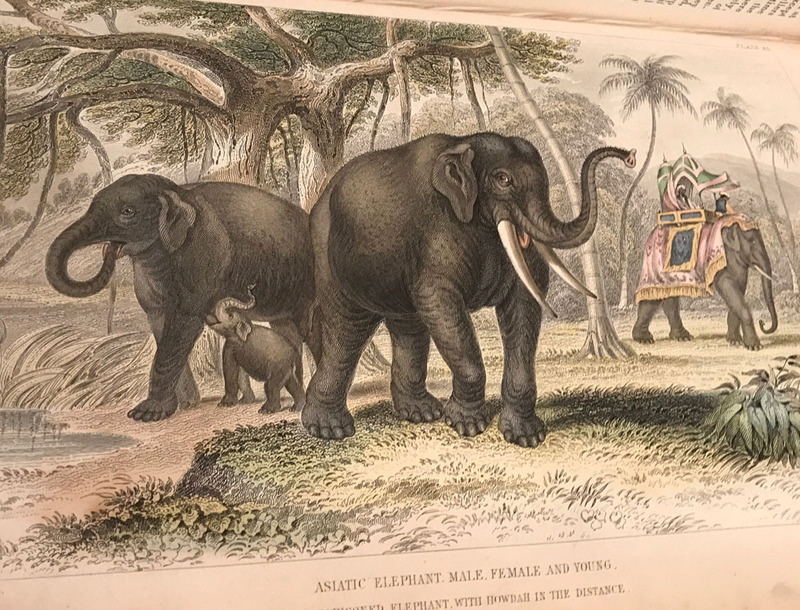 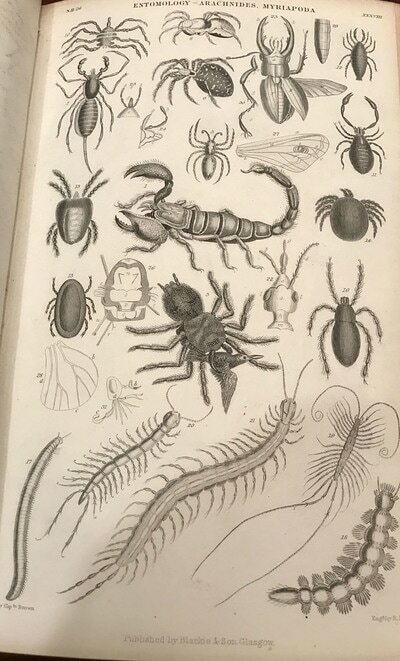 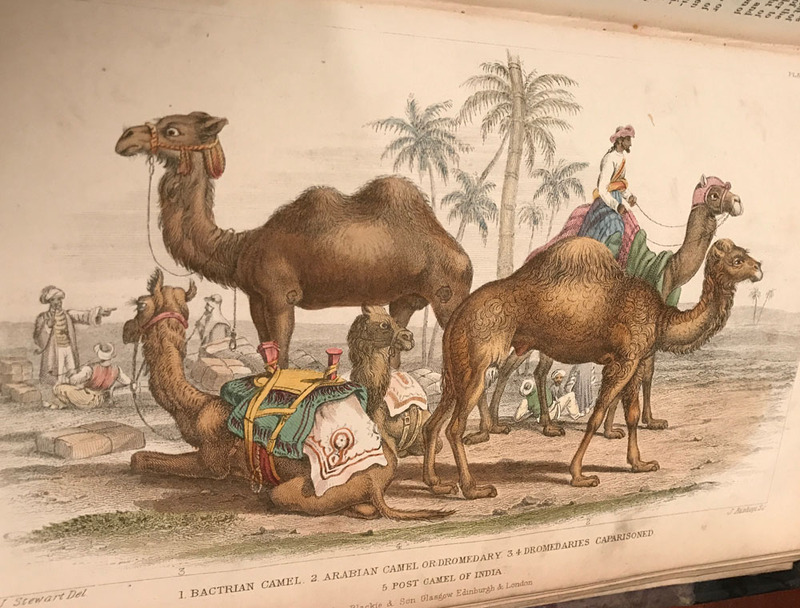 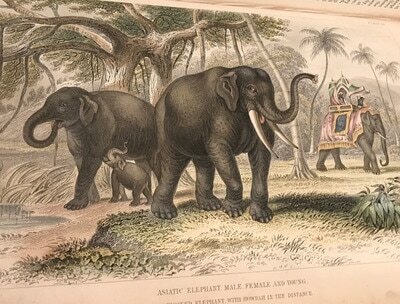 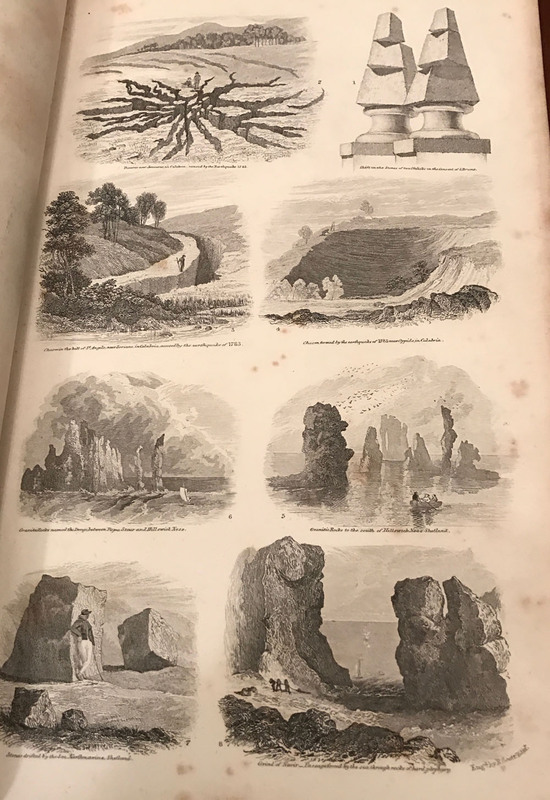 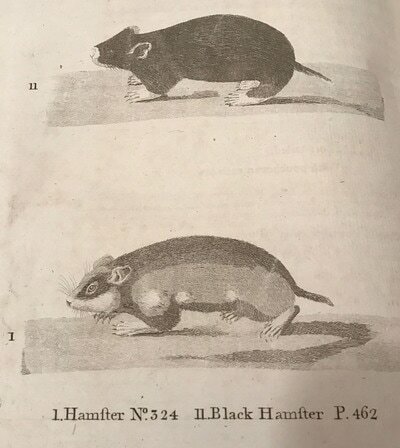 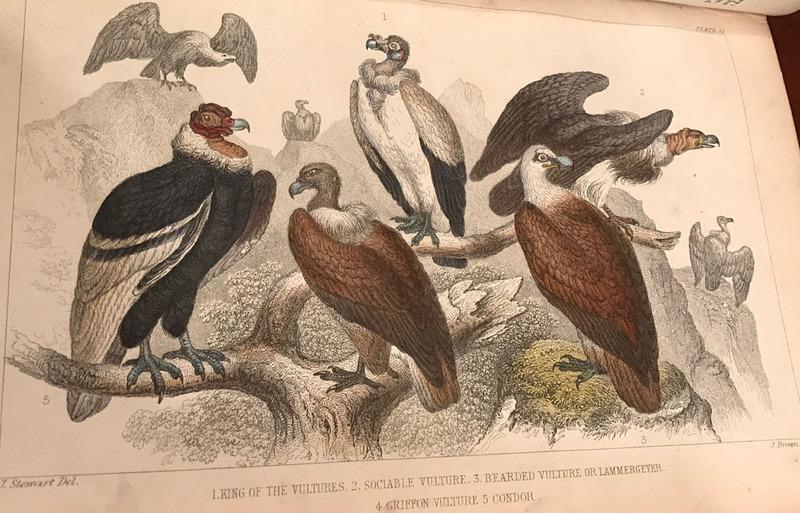 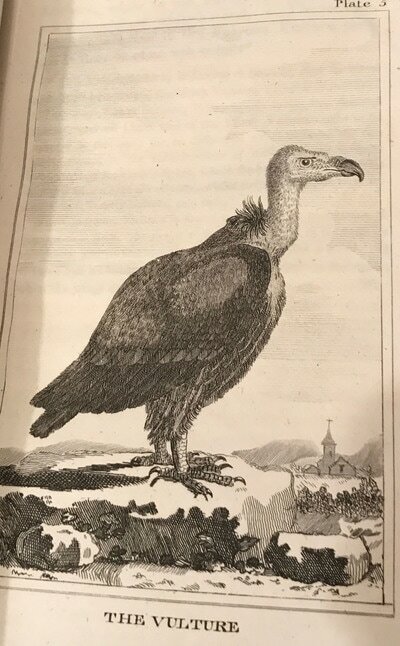 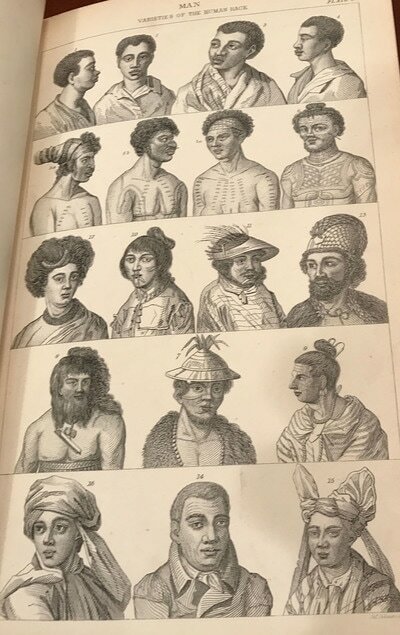 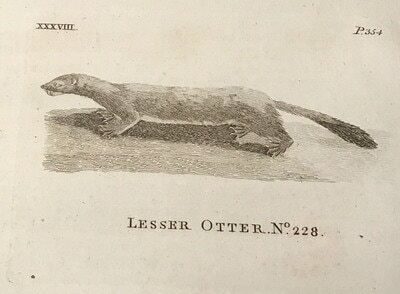 Followed by Preface, Classification of Animals, Contents of Vol I, Index of Plates and 13 Pages of B&W Plates having many small illustrations and one Fold-Out Plate showing Comparative Heights of Mountains. 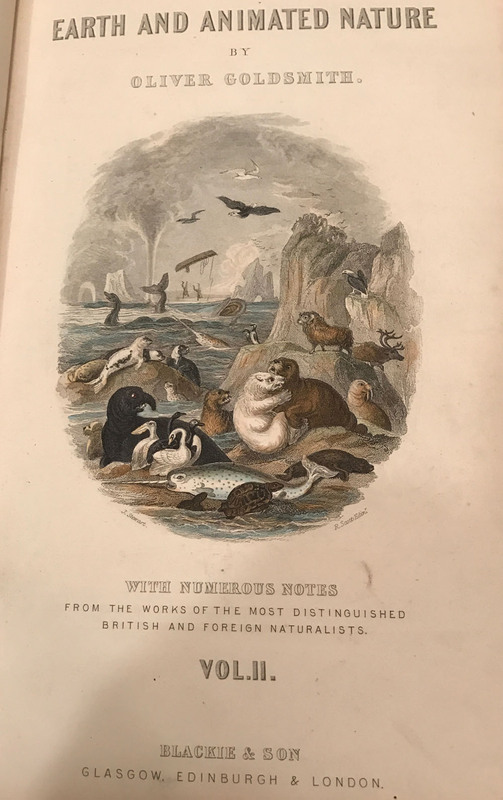 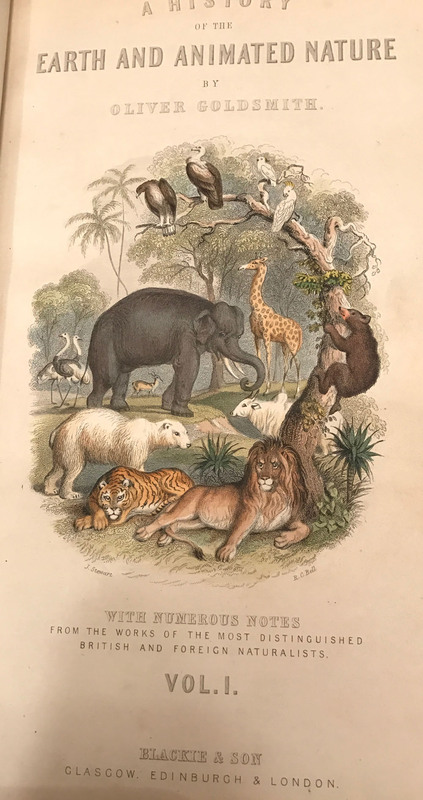 Vol II Frontispiece illustrated with engraved Portrait of Baron Cuvier opposite an illustrated, Coloured Title Page with many Birds and Beasts in a Coastal Scene, including a Sea-Serpent, followed by Contents page and many engraved plates of many small illustrations within. Both Volumes Beautifully illustrated throughout with 35 Full-Page Hand-Coloured Plates. Also many In-Text Engraved Illustrations. 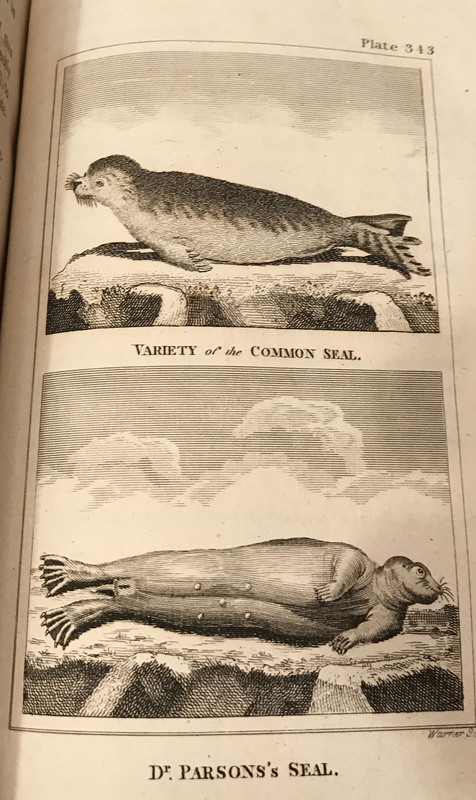 Vol I has 564 Pages and Vol II has 663. 10" Tall, some foxing to the back of the illustrated plates, which would be normal consider the quality of the paper at the time. A beautiful two volume set in good collectable condition..Complete. Oliver Goldsmith's A History of the Earth and Animated Nature has been described as everything from 'hackwork' to his 'most substantial literary legacy. The 1st. 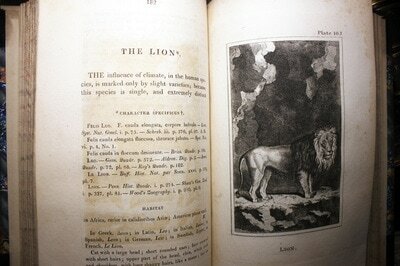 Edition appeared in London in 1774 as an eight volumes set, and was was pirated in the same year. The work sought to draw together virtually all that was known about the planet earth, up to that time, its plants and animals, and even its human inhabitants described from a biological perspective. 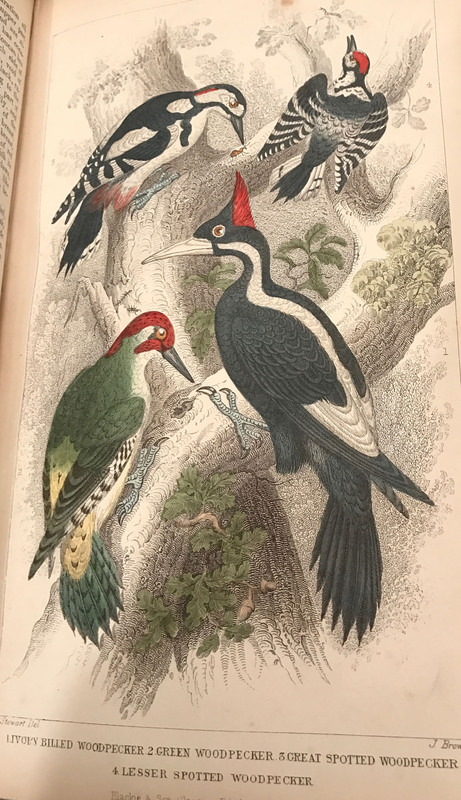 Although Goldsmith drew almost all of his information from the work of other naturalists, he set out with a very Romantic goal in mind. 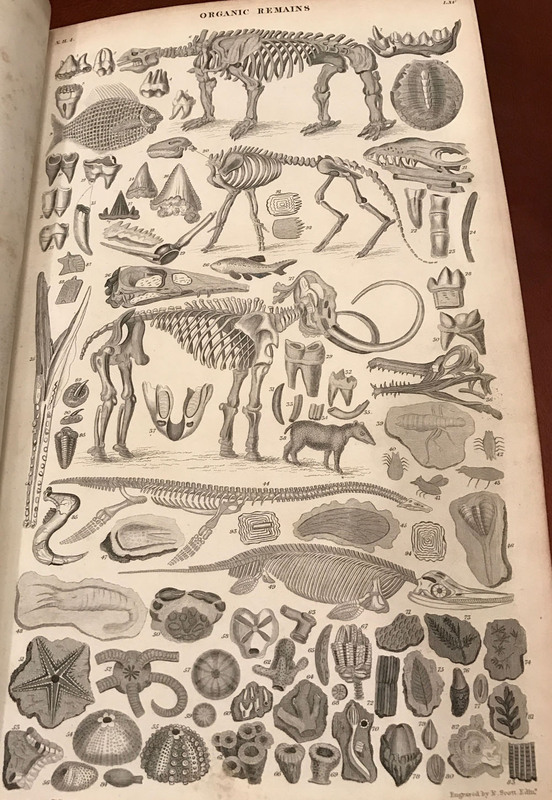 He had first planned to translate Pliny's Natural History and then, after reading Buffon, he decided that "the best imitation of the ancients was to write from our own feelings and to imitate nature." 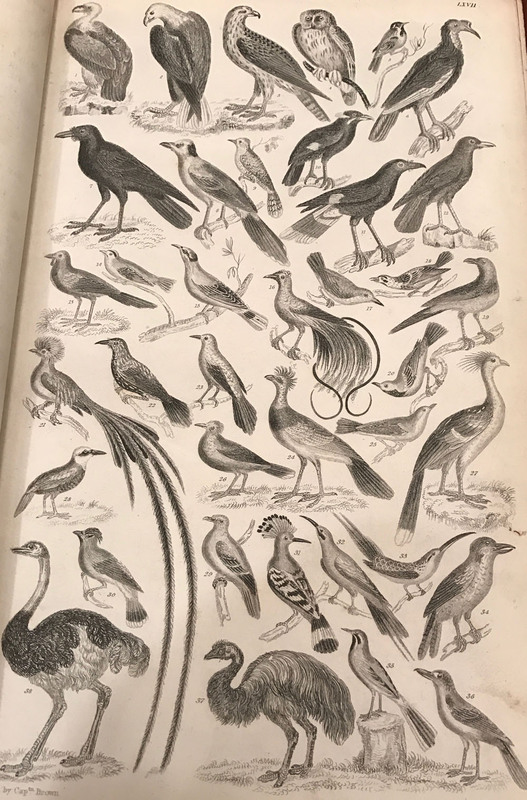 The linking of emotion and mimetic imitation to the natural world echoed precisely the claims poets would be making for the next century. 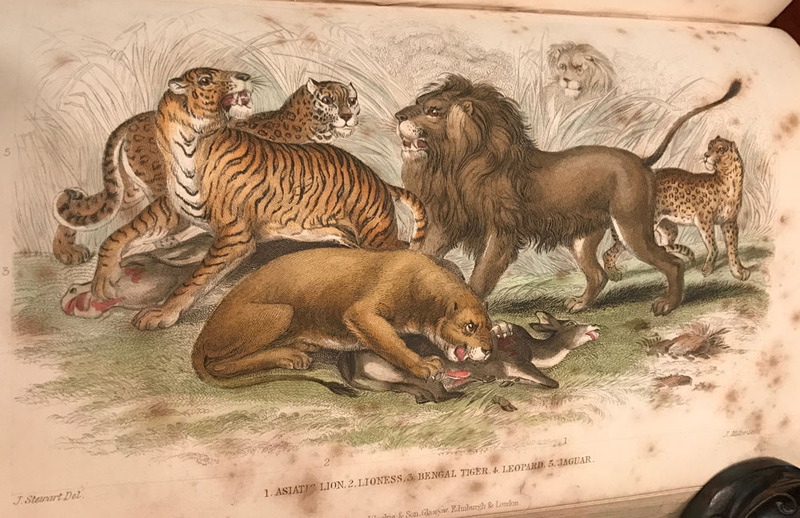 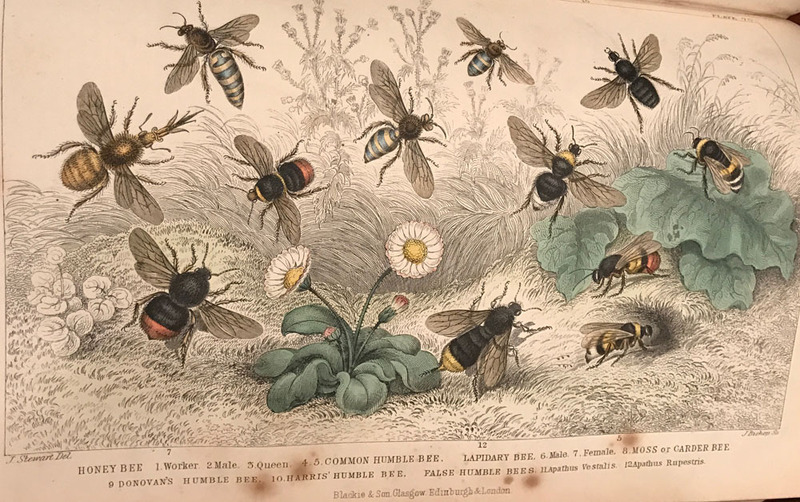 Goldsmith's Animated Nature went through over twenty editions into the Victorian era; though it can be criticised on technical grounds, the work became the source of what countless individuals in the English-speaking world knew about the natural world around them. Goldsmith wrote with clarity and precision; for example, he admitted one of the most common confusions in natural history of the period in his discussion of the "border" between plants and animals: it frequently puzzles the naturalist to tell exactly where animal life begins, and vegetable terminates; nor, indeed, is it easy to resolve, whether some objects offered to view be of the lowest of the animal, or the highest of the vegetable races. 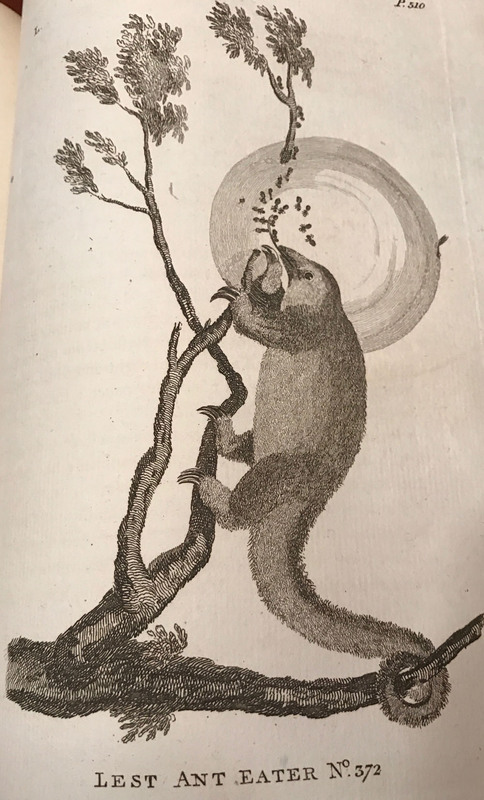 The sensitive plant, that moves at the touch, seems to have as much perception as the fresh water polypus, that is possessed of a still slower share of motion. Besides, the sensitive plant will not reproduce upon cutting it in pieces, which the polypus is known to do; so that the vegetable production seems to have the superiority. Goldsmith weighed in on the side of those who believed that all human varieties derived from a single species, admitting however that great changes seemed able to occur in individual members of a species, including our own. 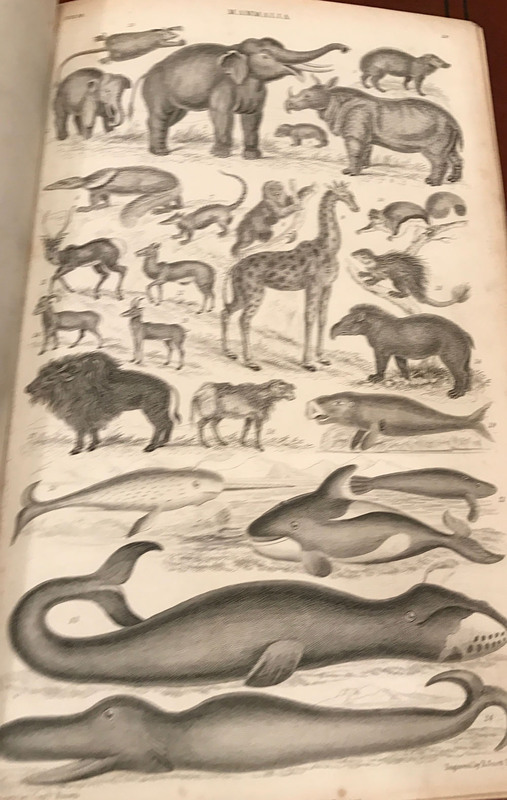 His entire discussion of humans takes place, significantly, in a section of his work entitled "An History of Animals": "If we look round the world, there seem to be not above six distinct varieties in the human species, each of which is strongly marked, and speaks the kind seldom to have mixed with any other. 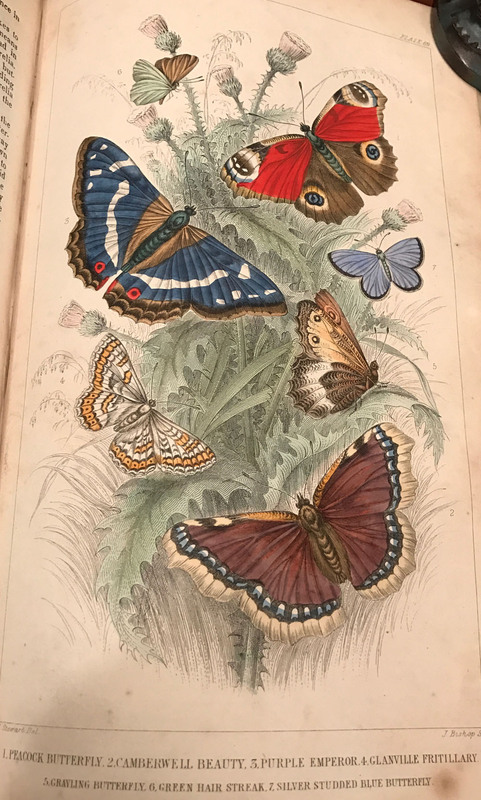 But there is nothing in the shape, nothing in the faculties, that shows their coming from different originals; and the varieties of climate, of nourishment, and custom, are sufficient to produce every change." Dr. Johnson wrote an epitaph in Westminster Abbey that affirms natural history's importance in Goldsmith's canon: "To the Memory of Oliver Goldsmith, poet, naturalist and historian.